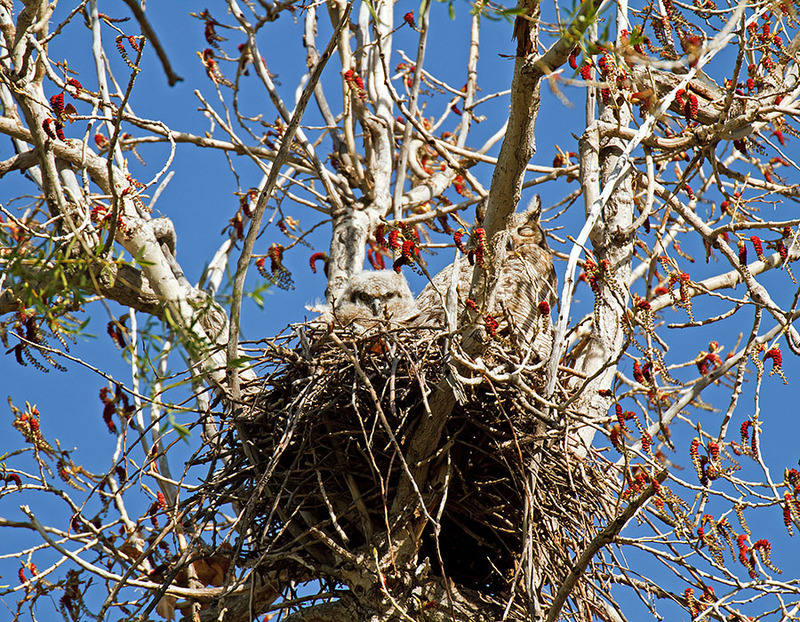 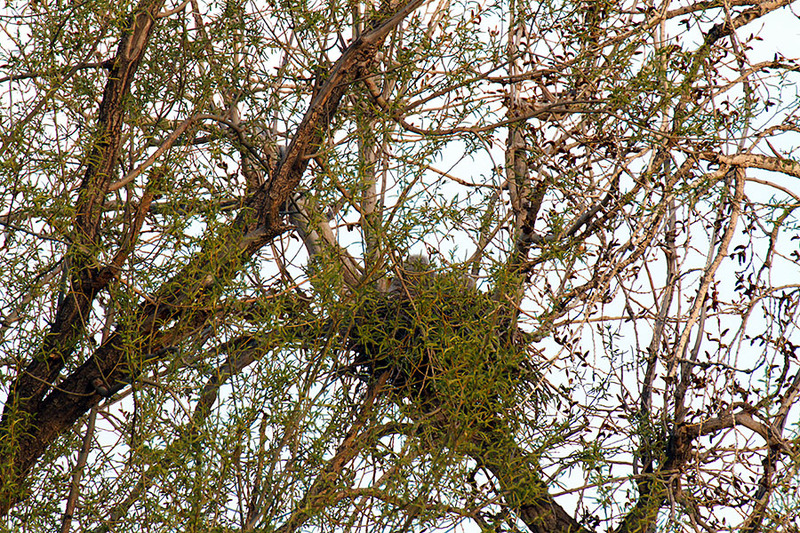 Great Horned Owl Nest - WOW! 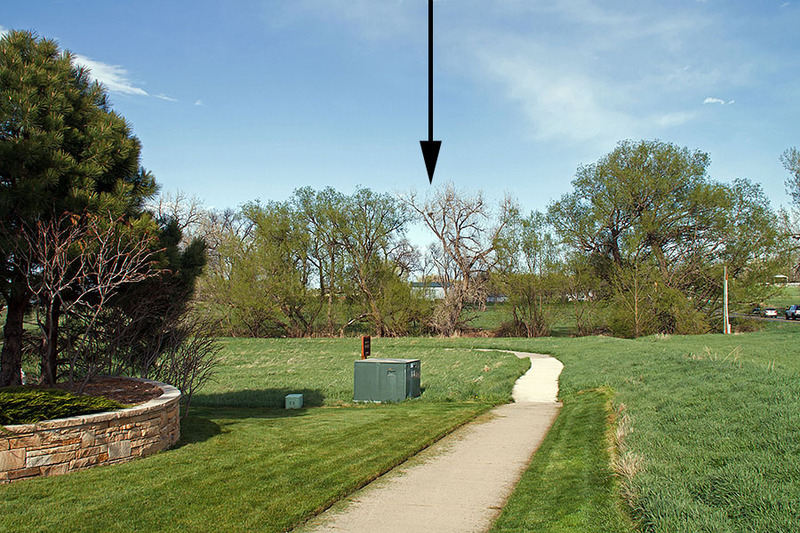 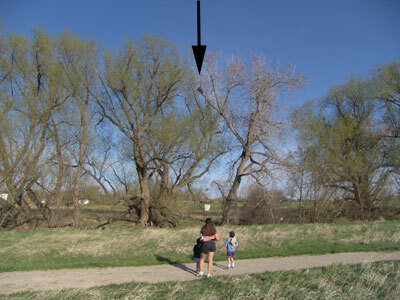 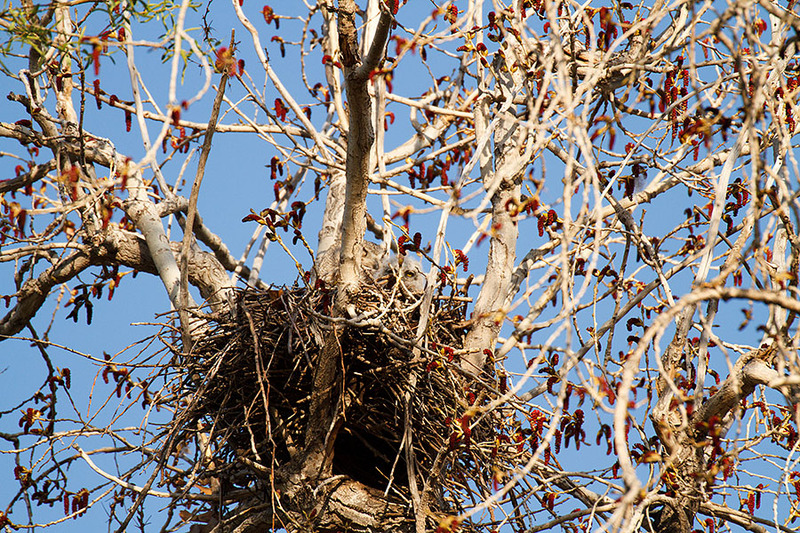 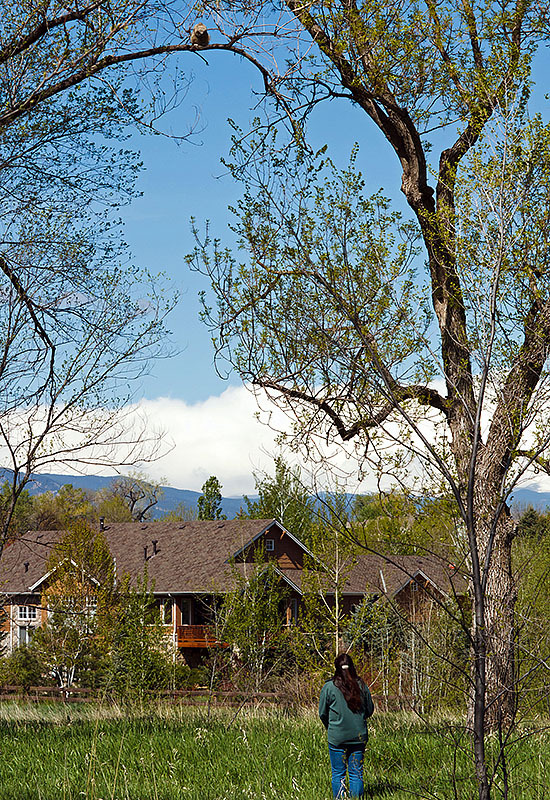 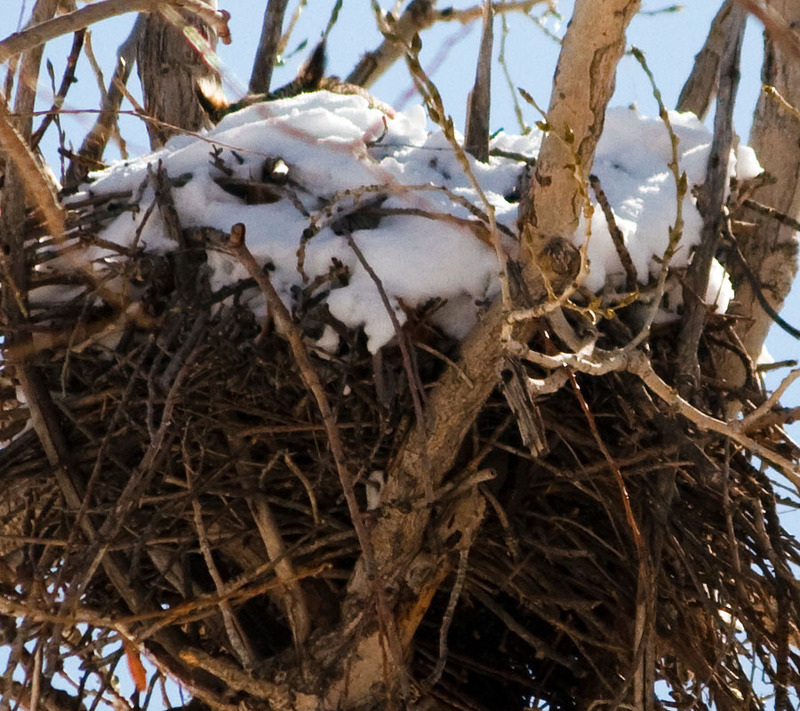 There are some large cottonwood trees East of our house that have had a bird nest for years. 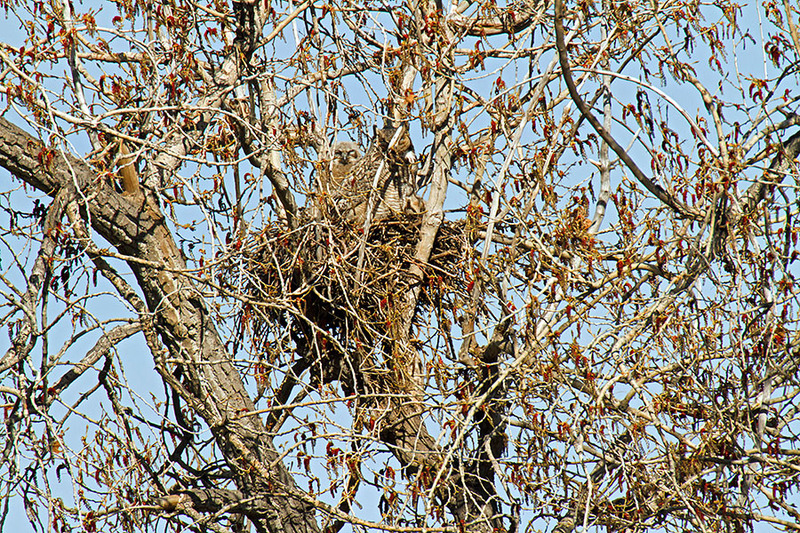 In 2005, we saw some Great Horned owls nesting there (see bottom pictures) ... but a few years later, the nest was taken over by some Red-Tailed Hawks. 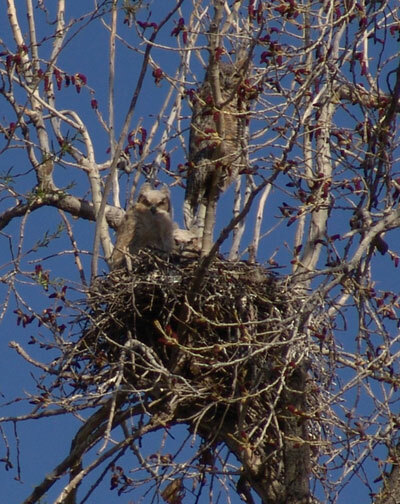 And if you want to see some really close-up pictures and video of birds, check out these House Finches! 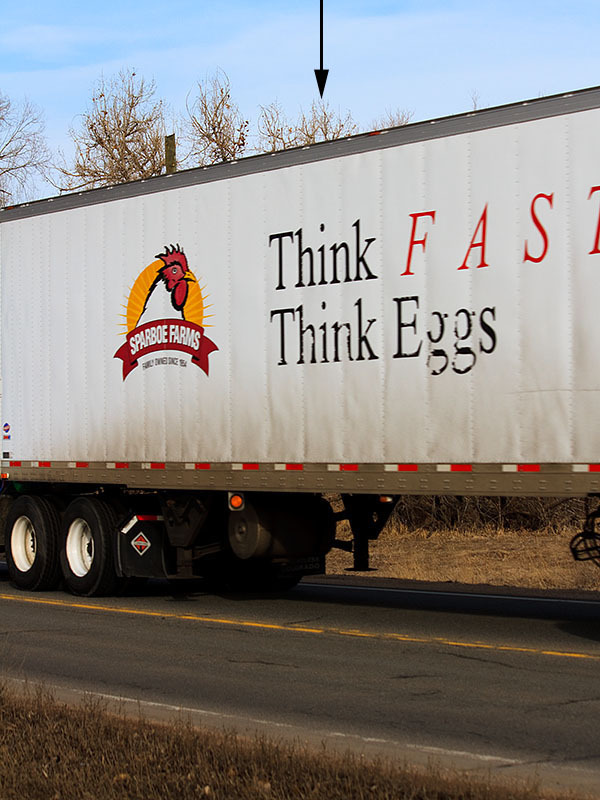 Mouseover image to see nest without "Think Eggs" Truck! 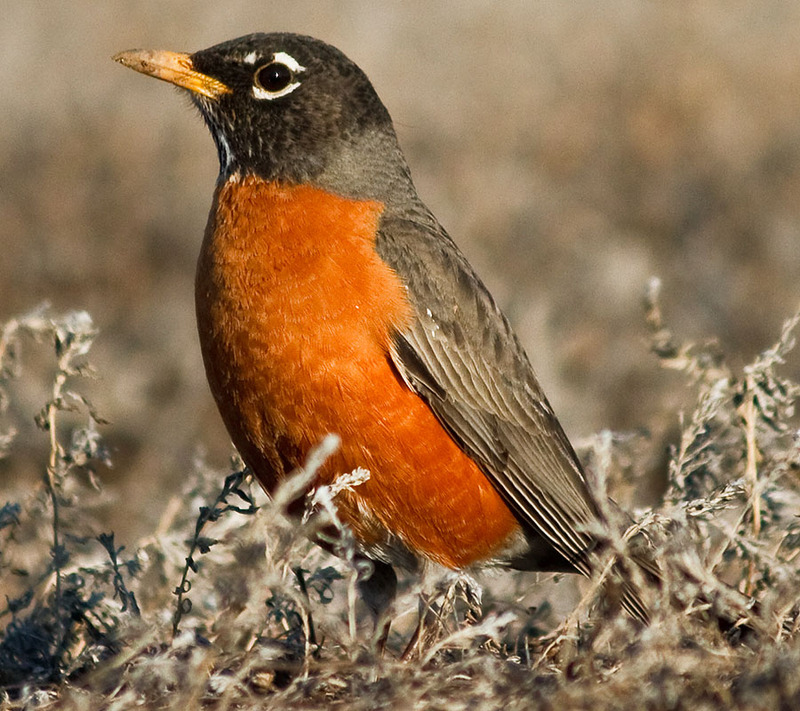 A nearby Robin at ground level - much better angle to take pictures and you can get closer! 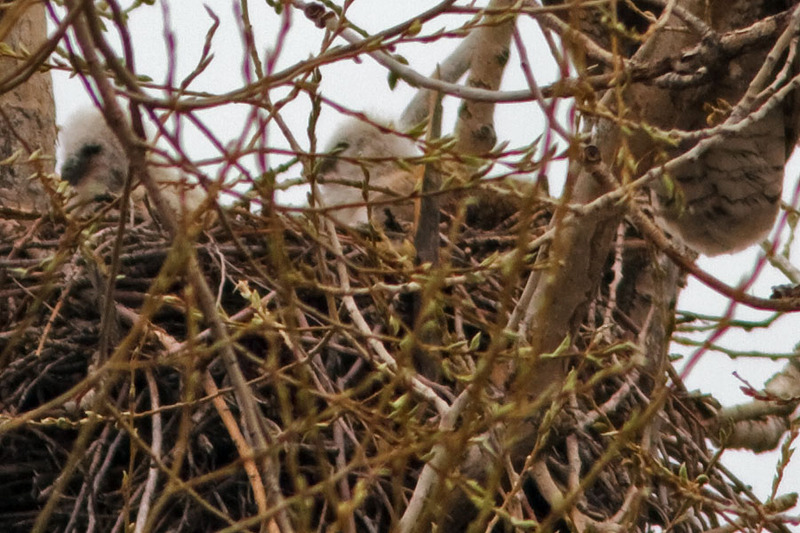 The view from the neighbor's deck is closer, but getting very green and cluttered - darn! 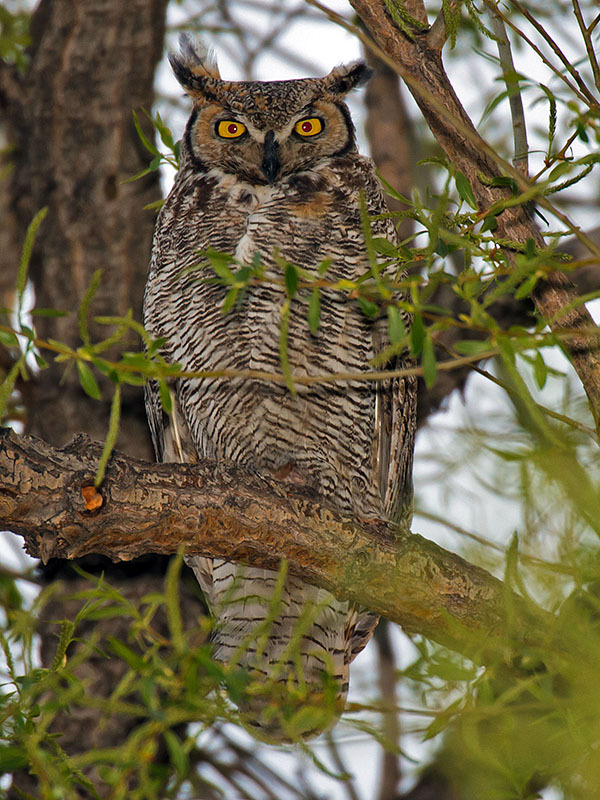 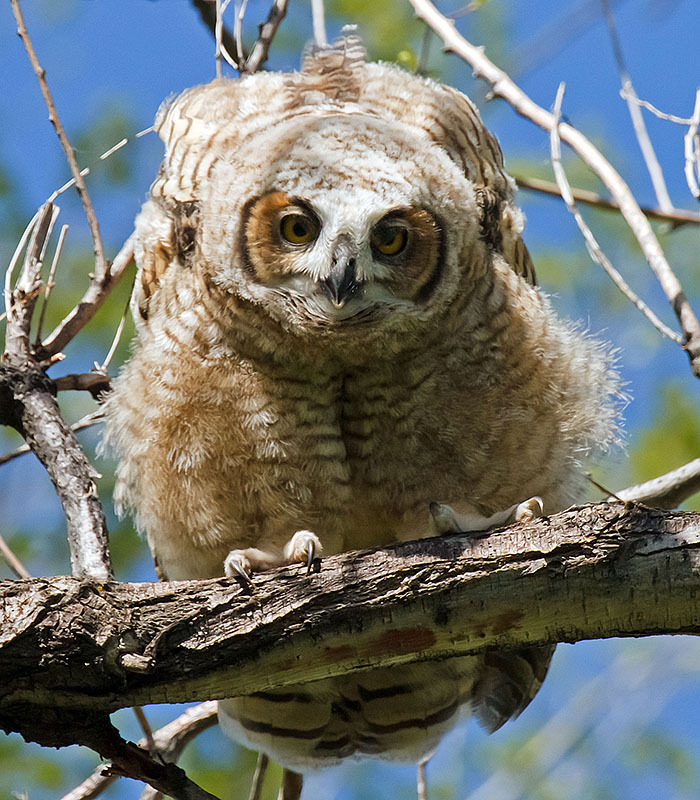 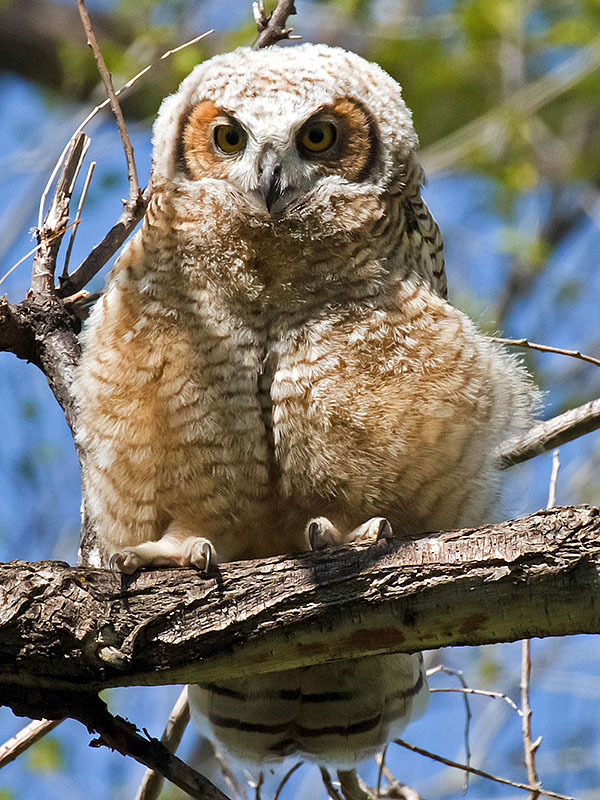 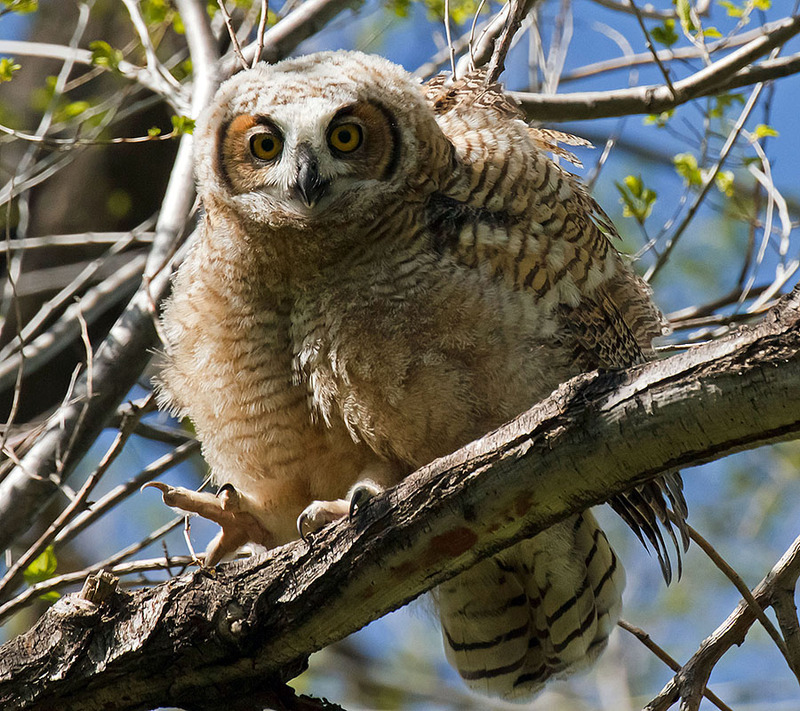 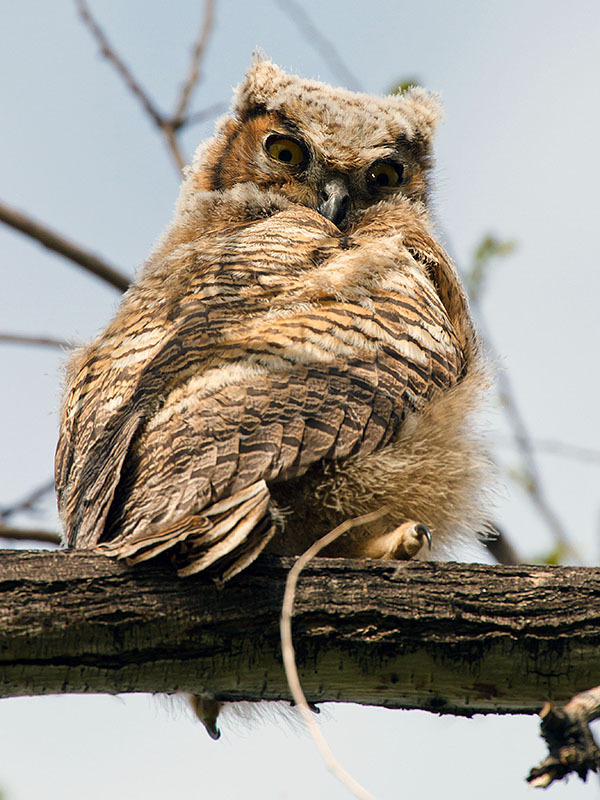 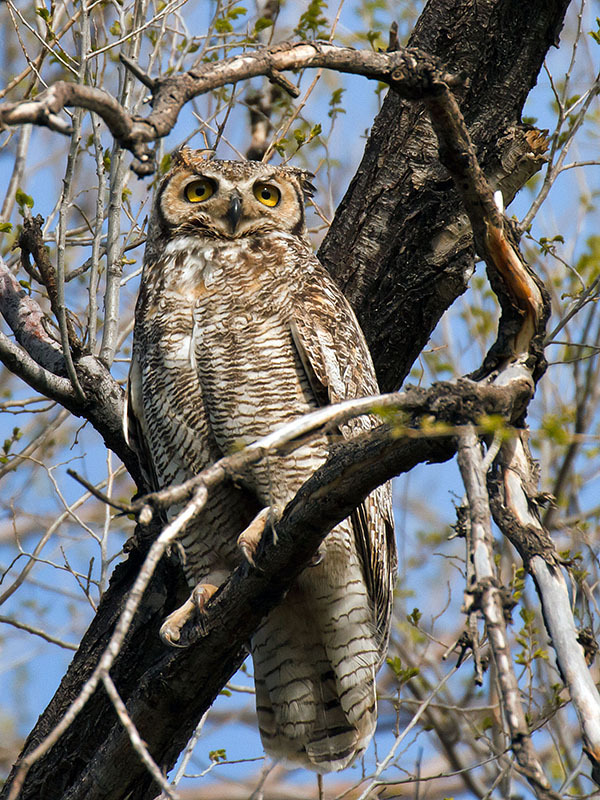 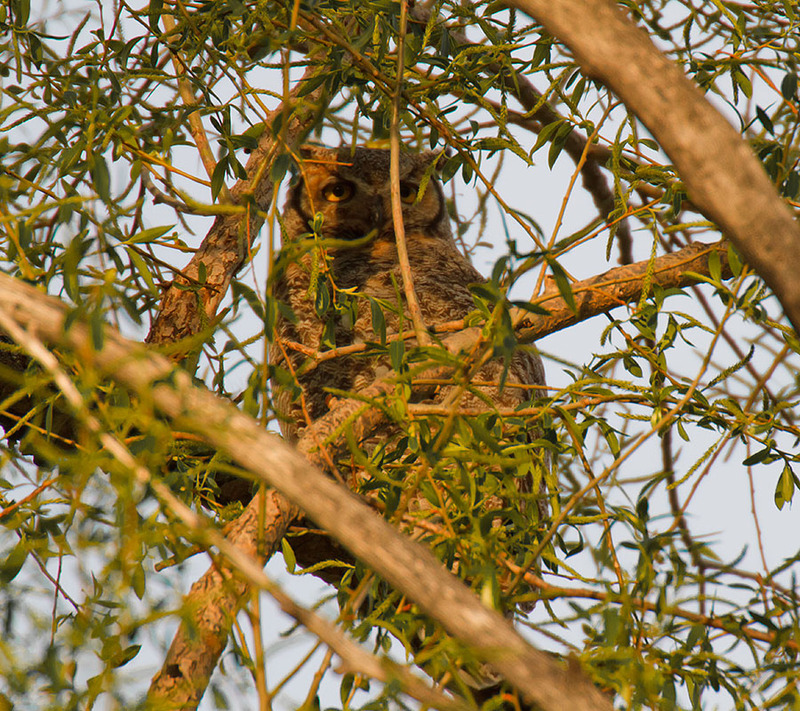 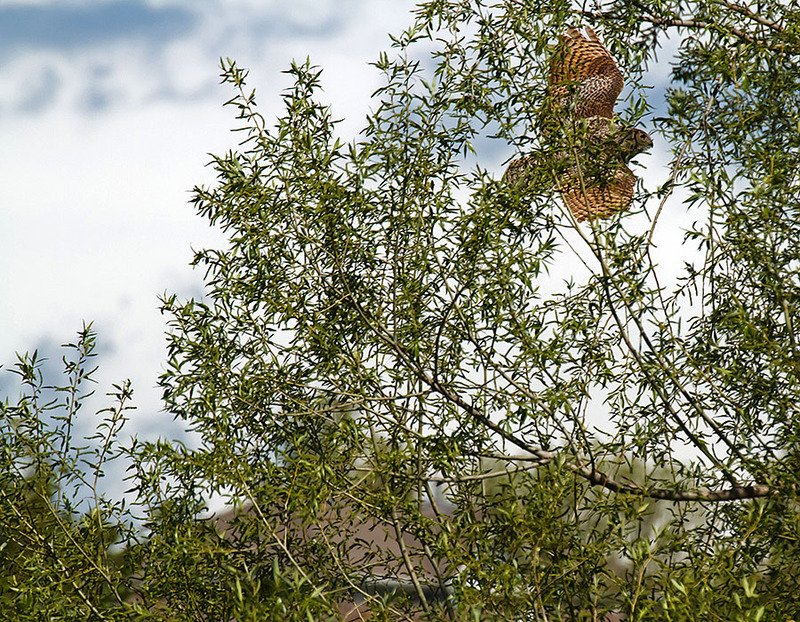 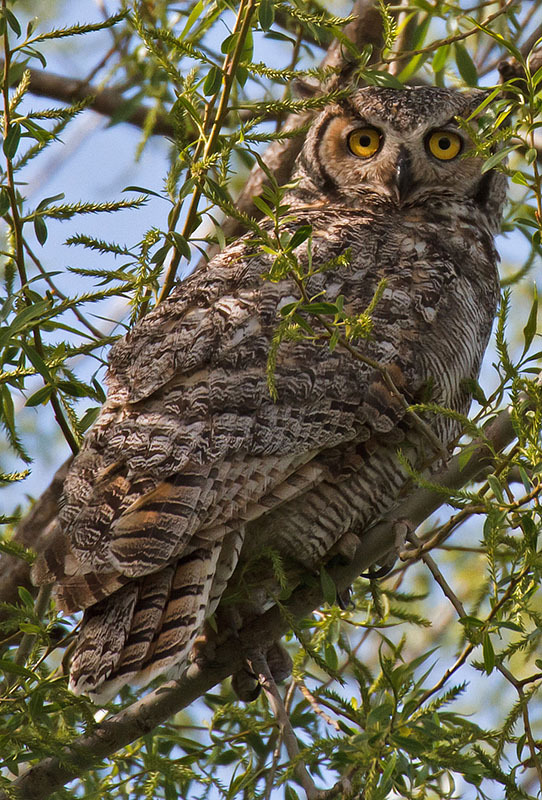 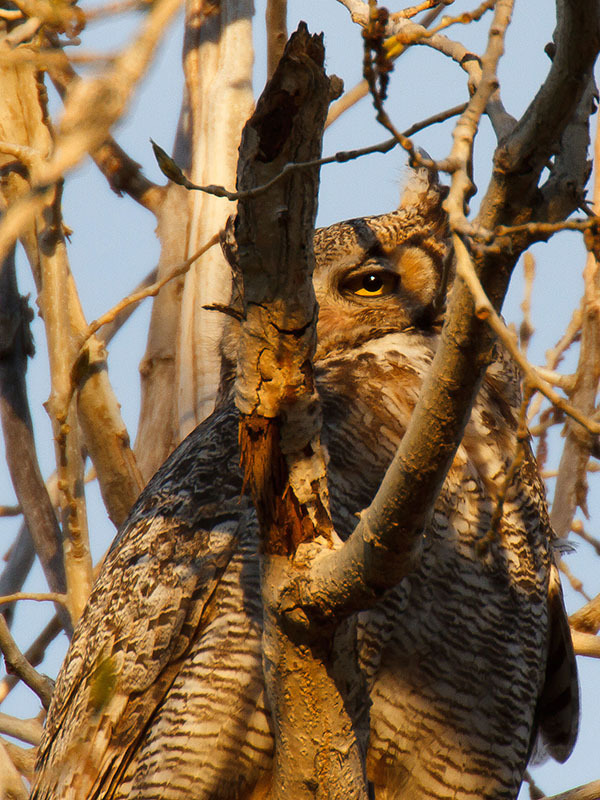 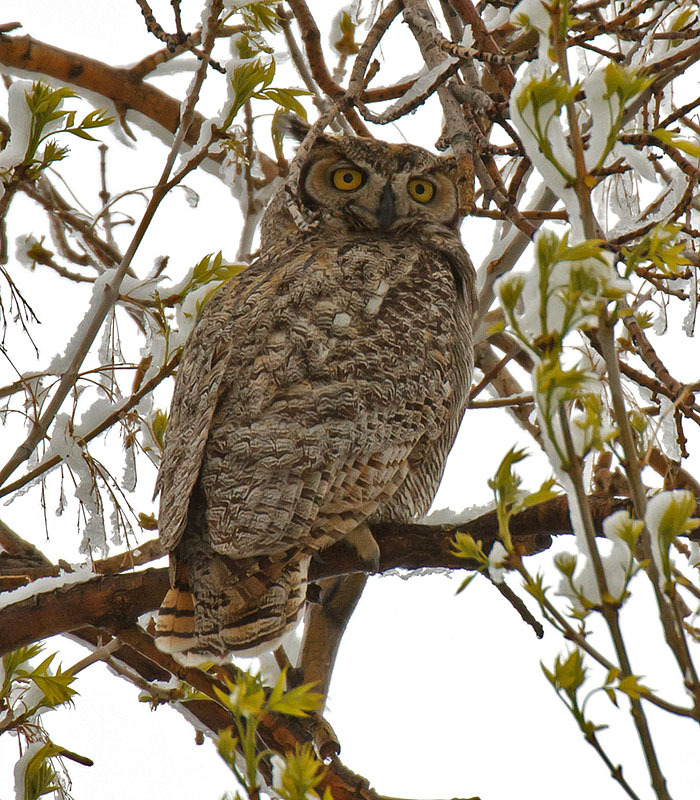 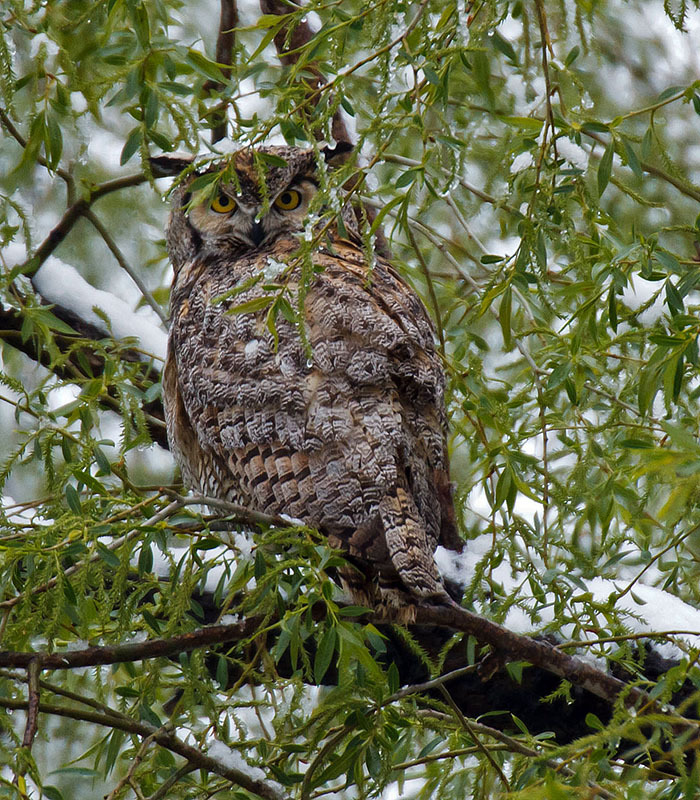 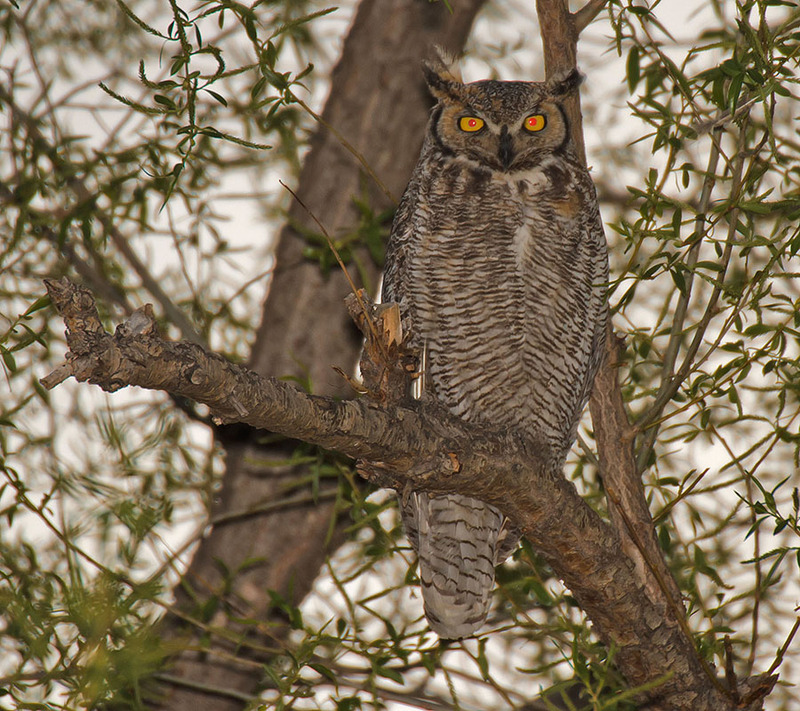 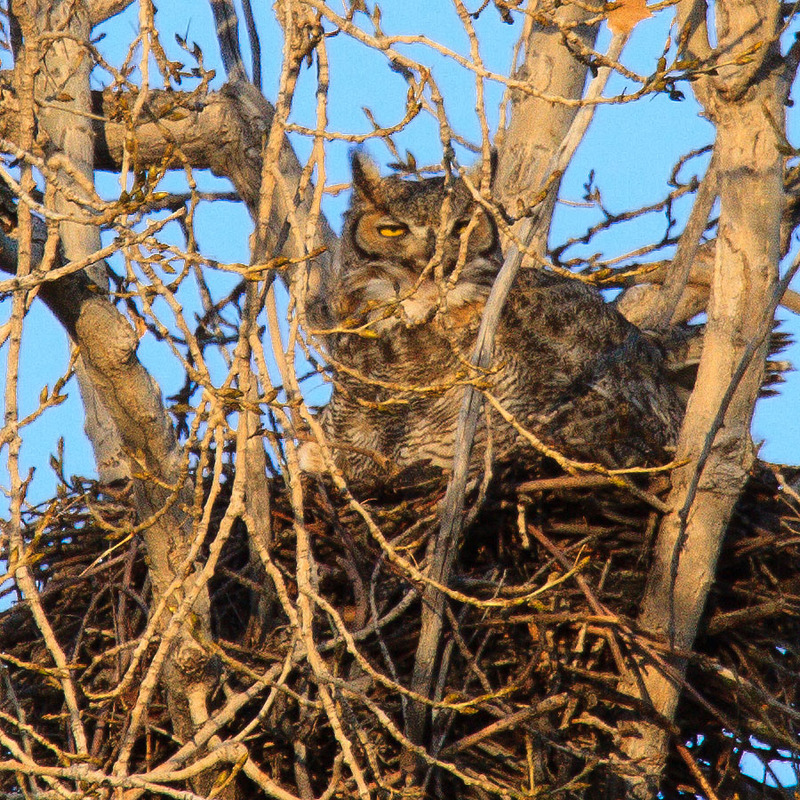 Watch video of clutter and then a squirrel checks out the Great Horned Owl Nest - WILD! 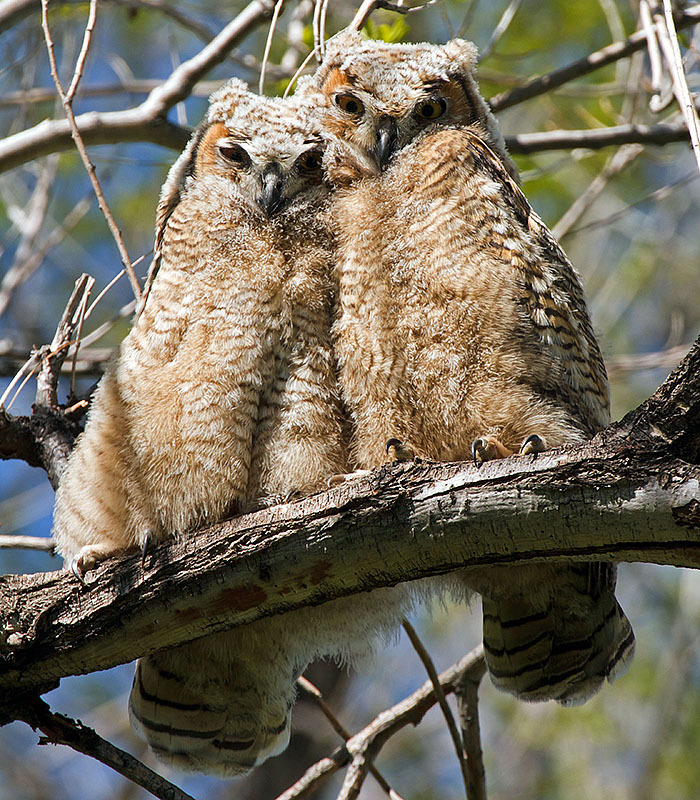 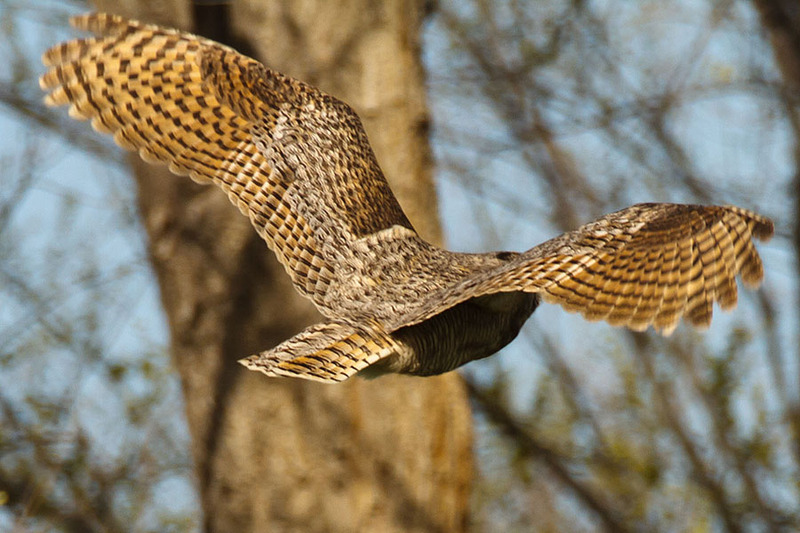 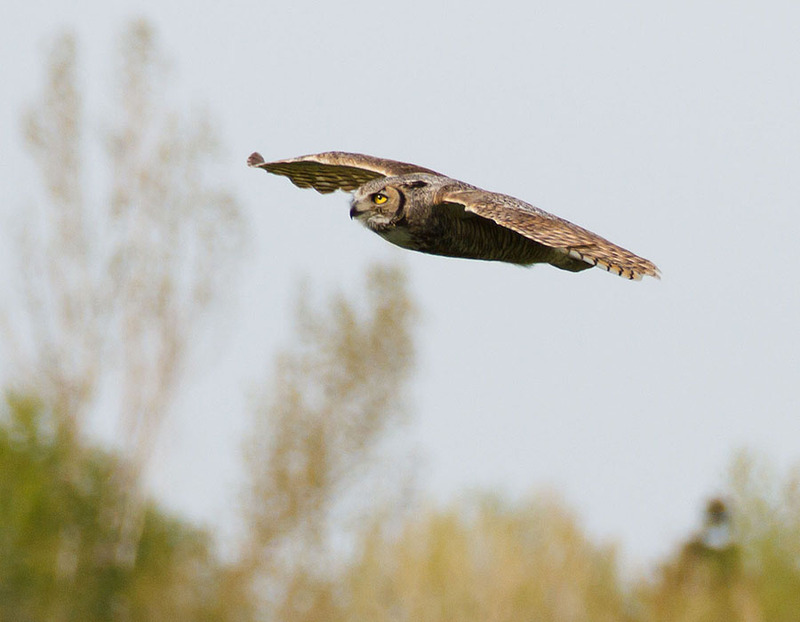 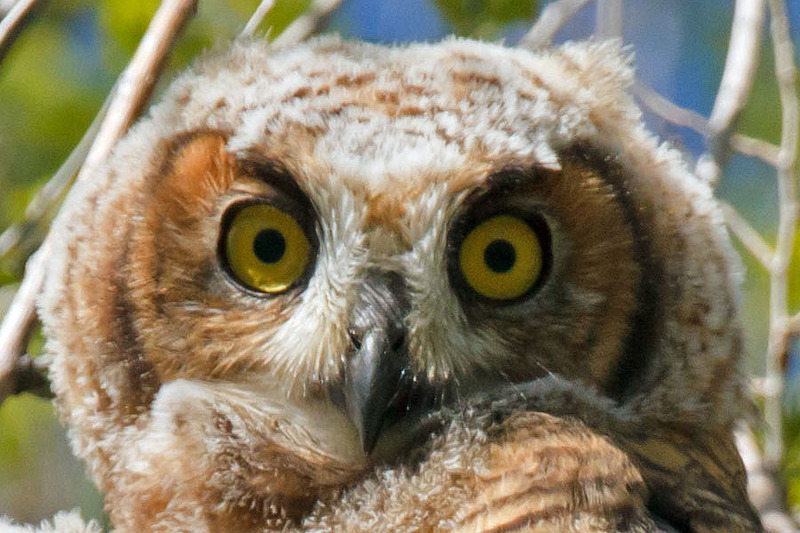 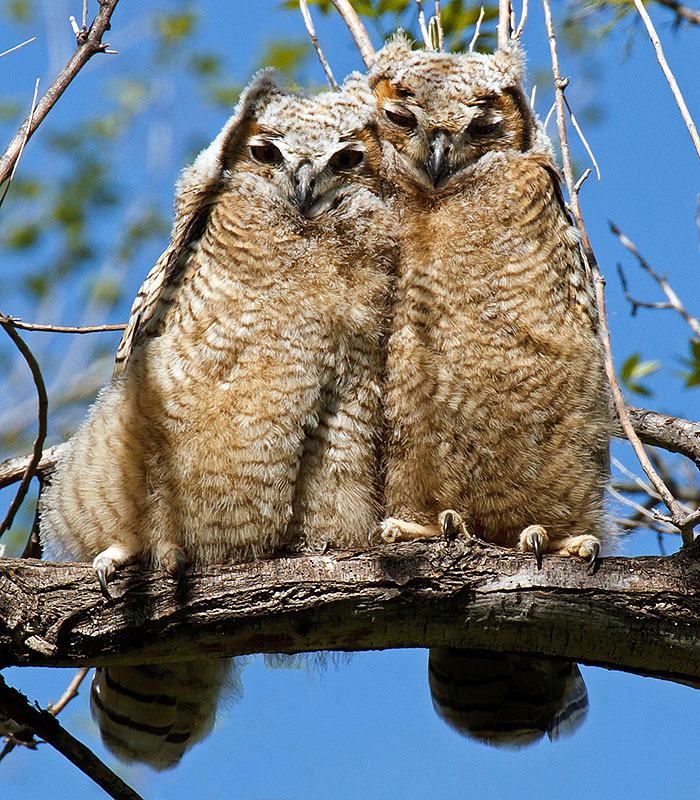 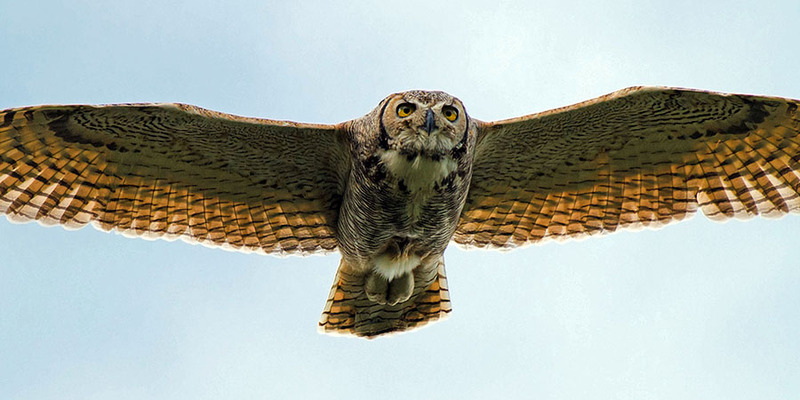 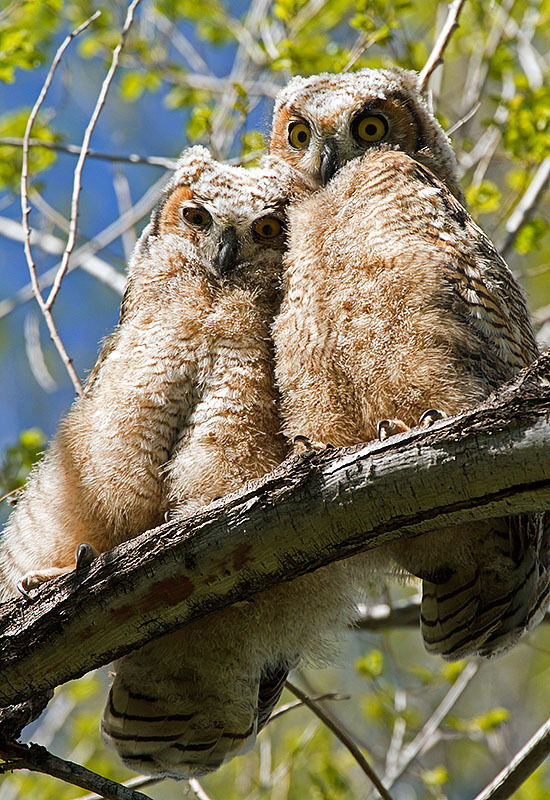 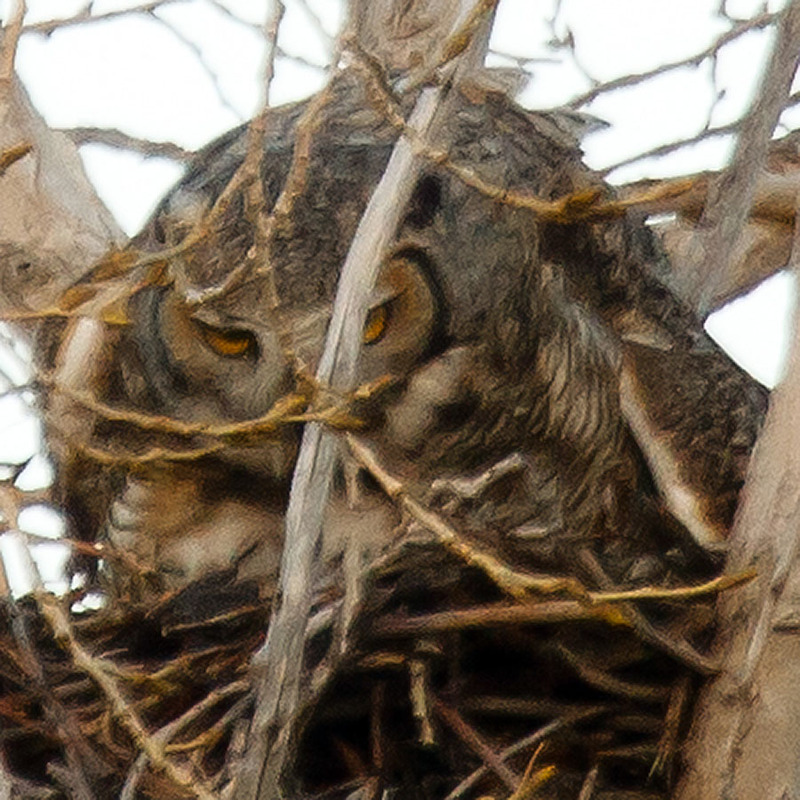 Mouseover image to see Momma Owl give us the beady eye! 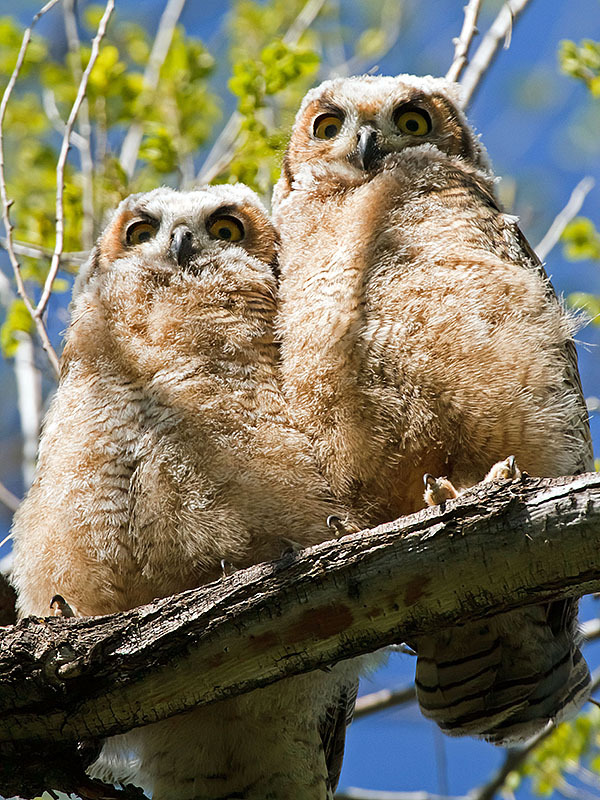 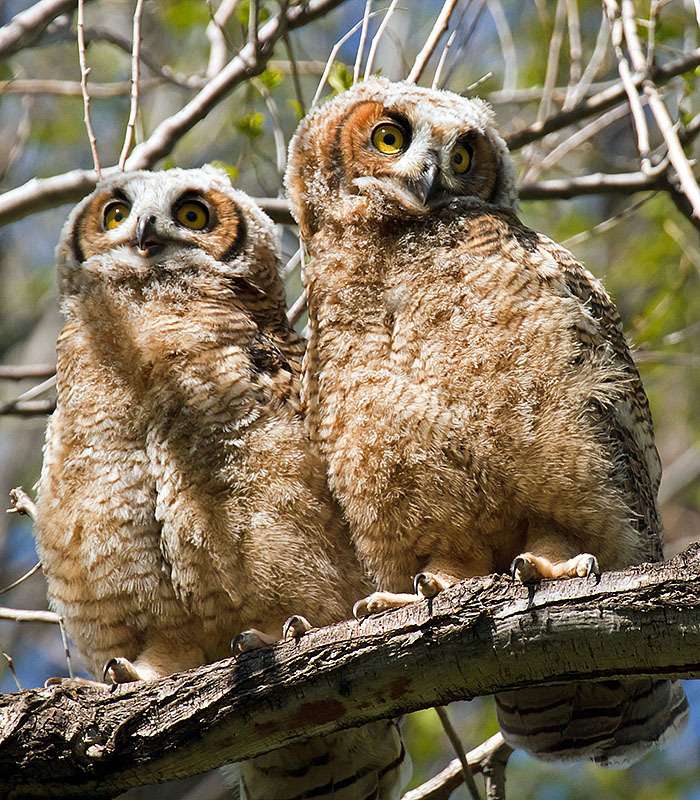 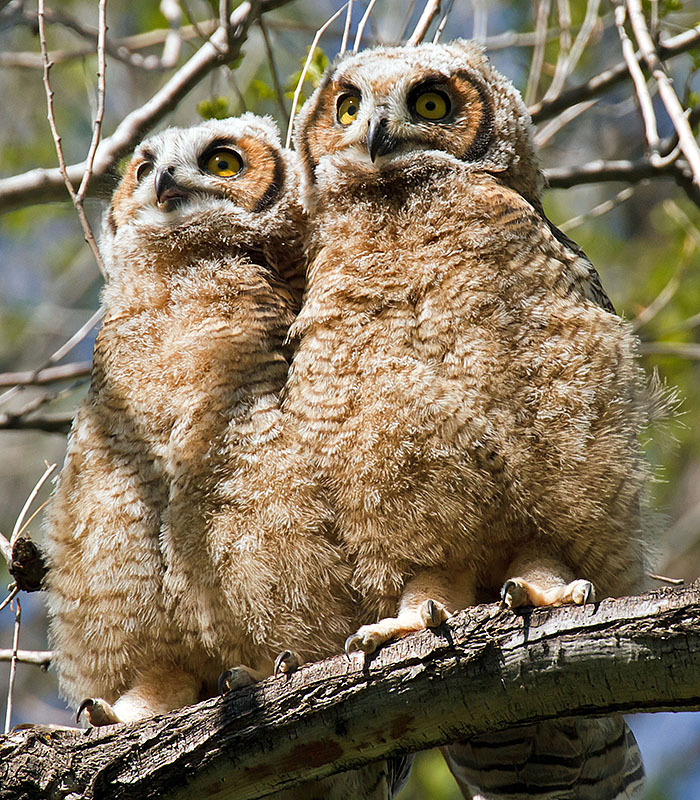 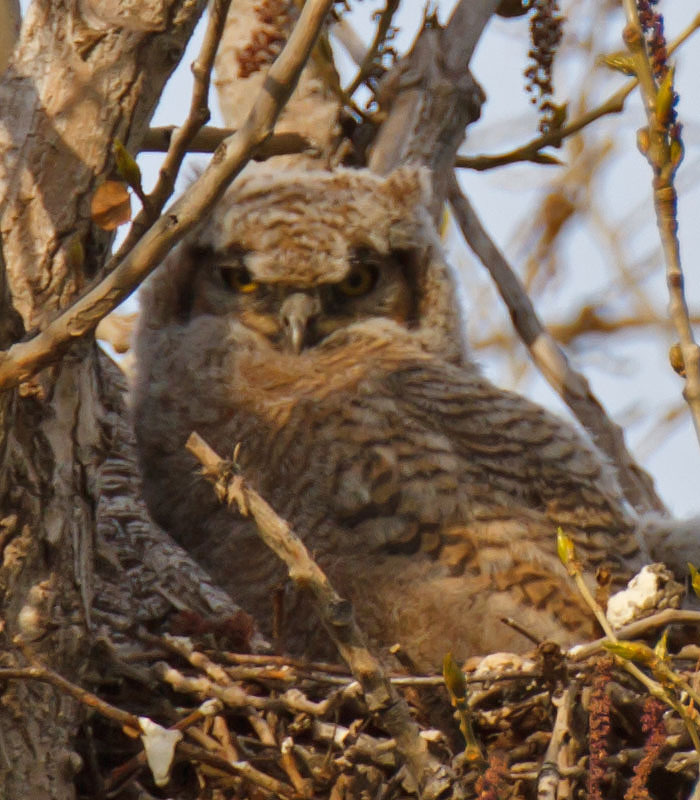 Owlet spreads its wings - Mom then imitates it! 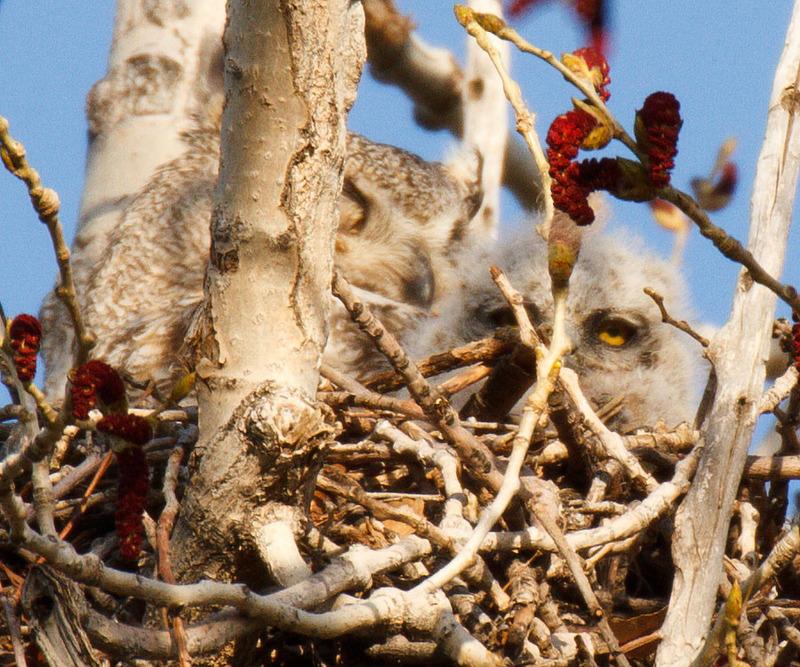 Owlet gives a big yawn! 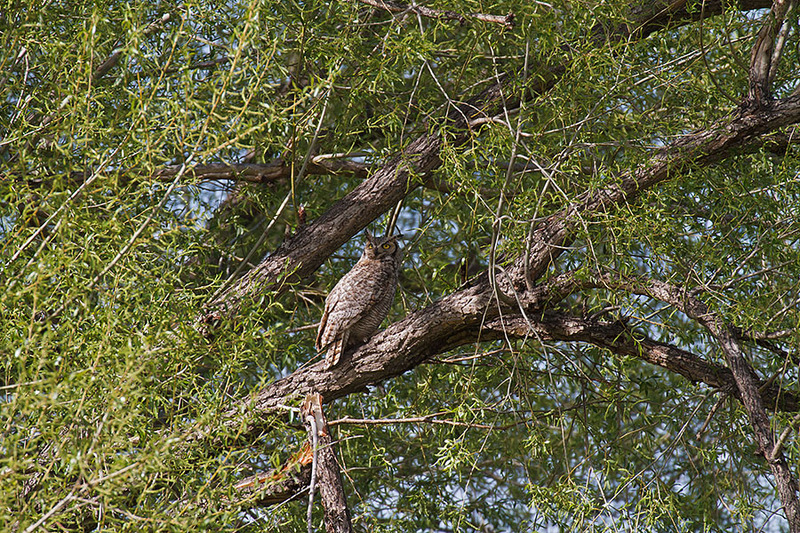 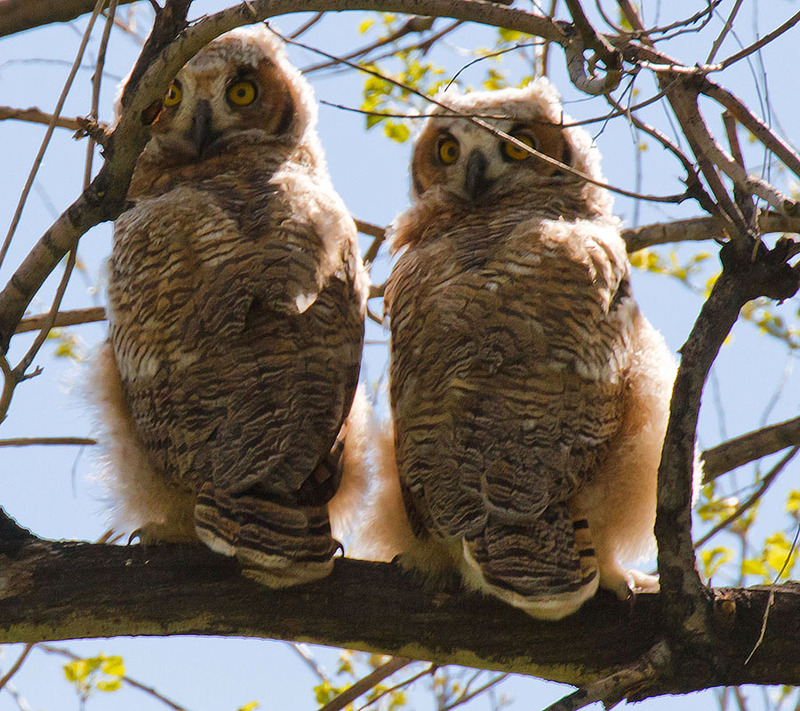 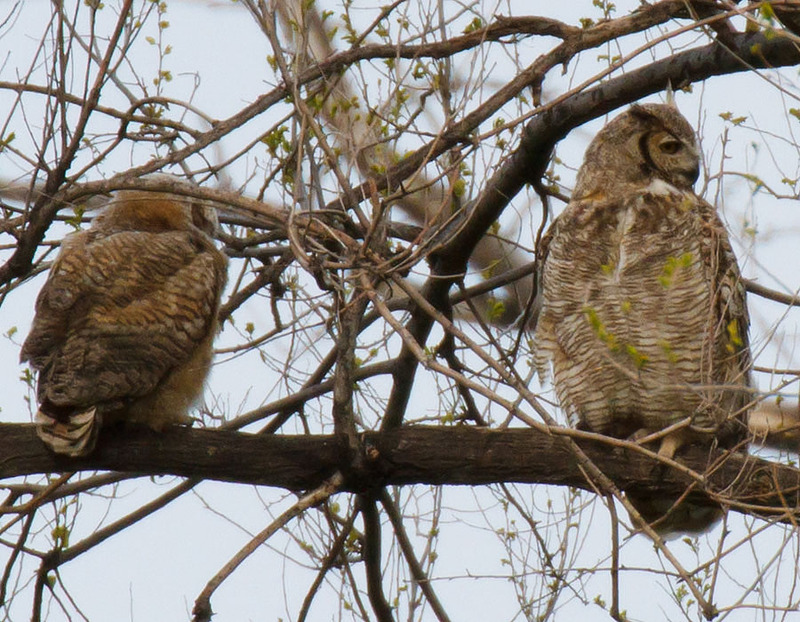 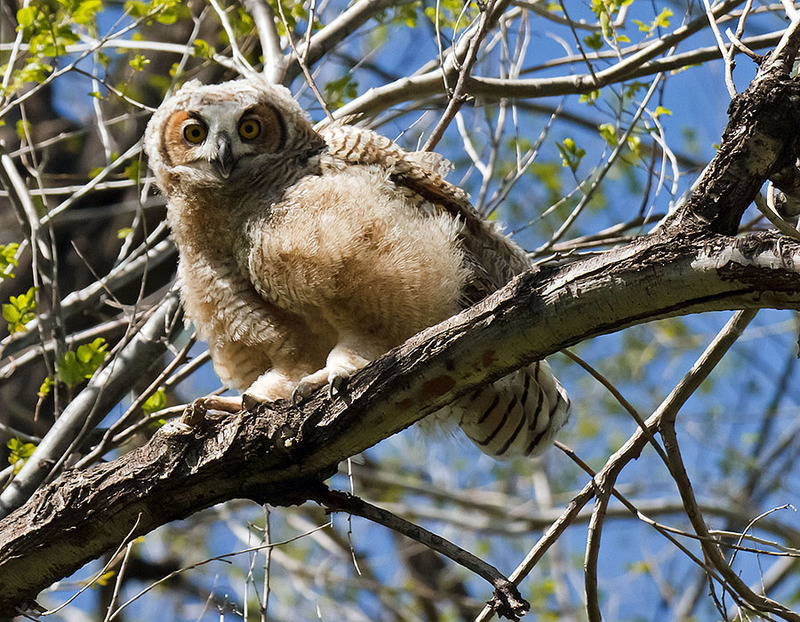 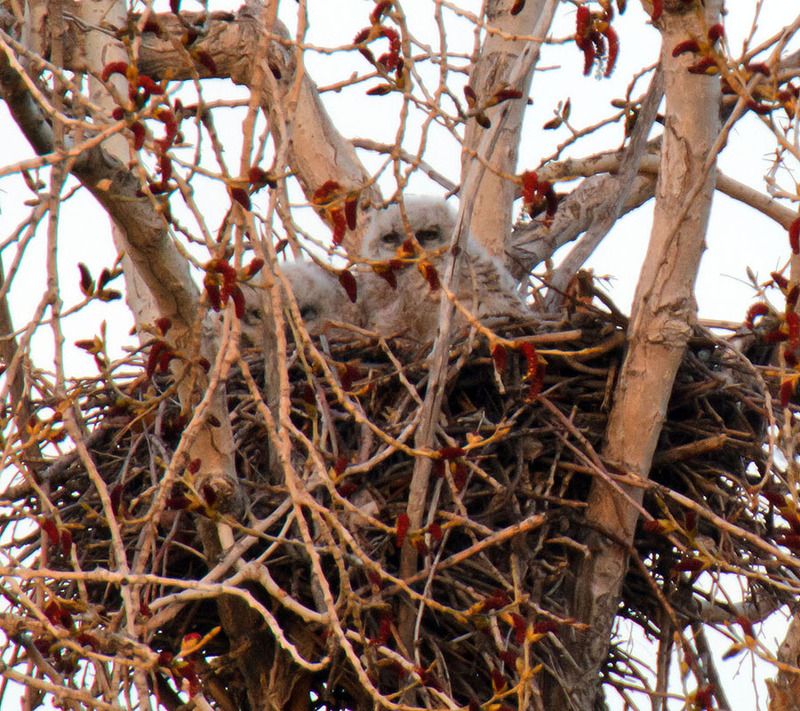 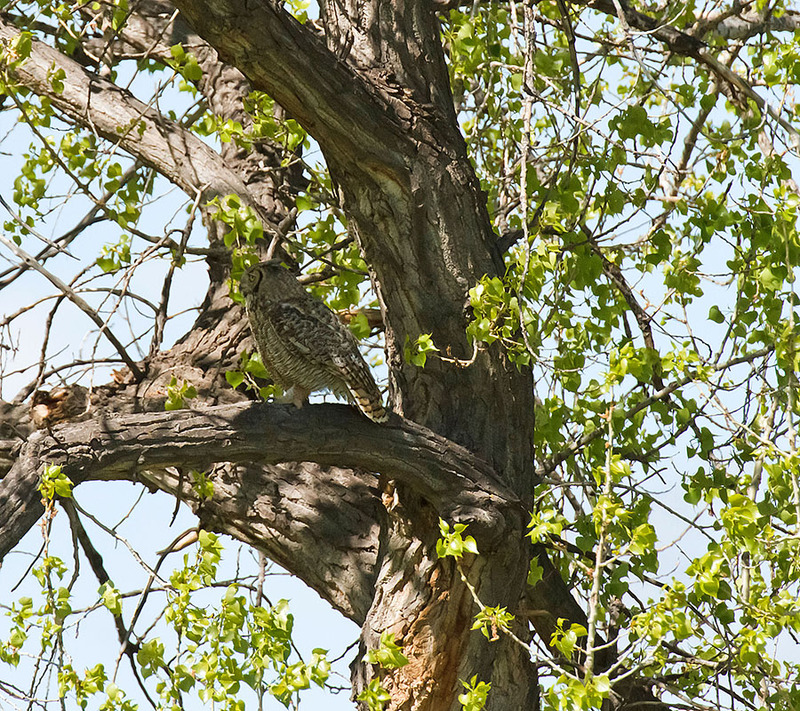 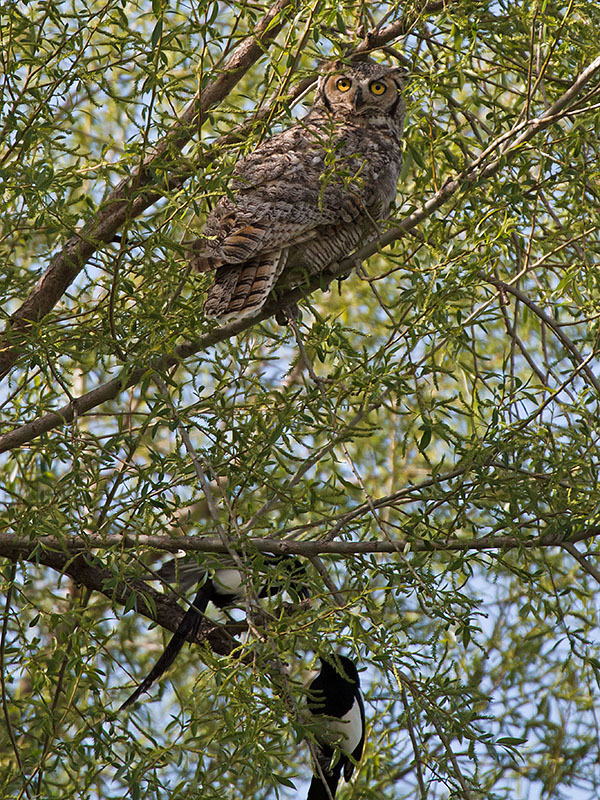 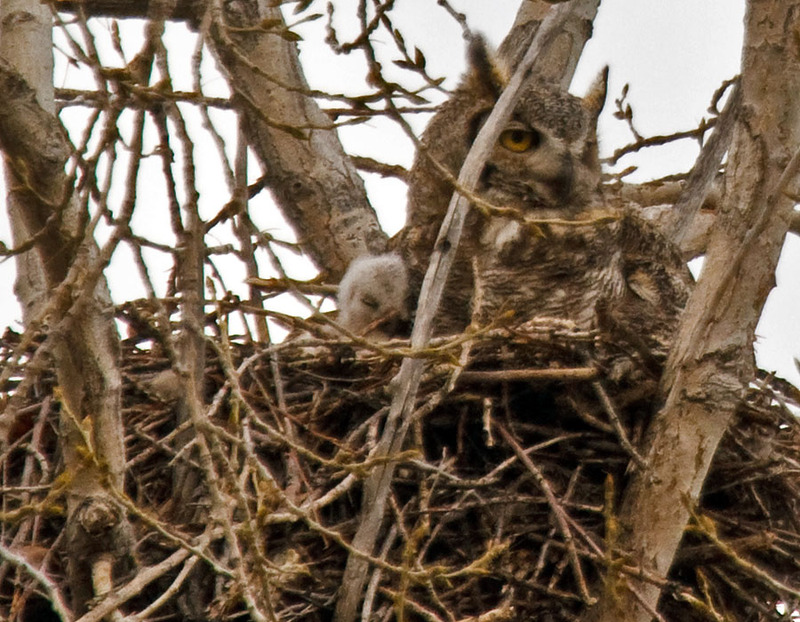 May 5th: Momma Owl in nearby tree, but no owlets in nest - they have fledged! 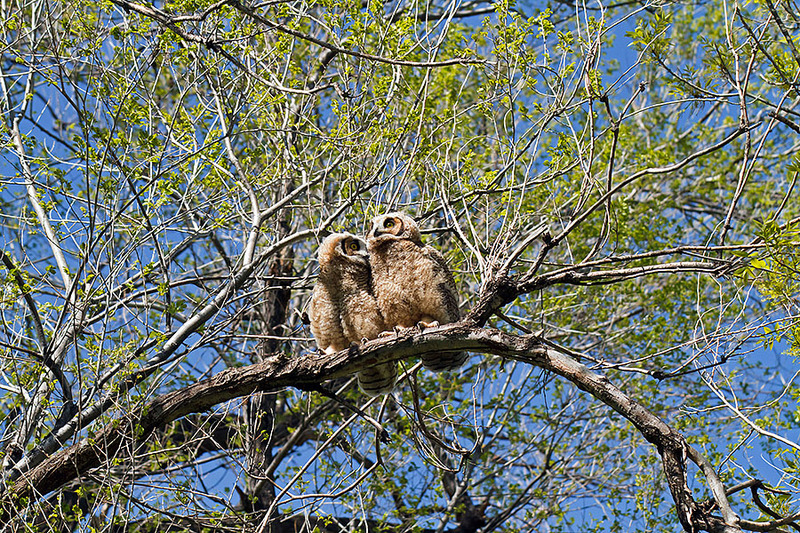 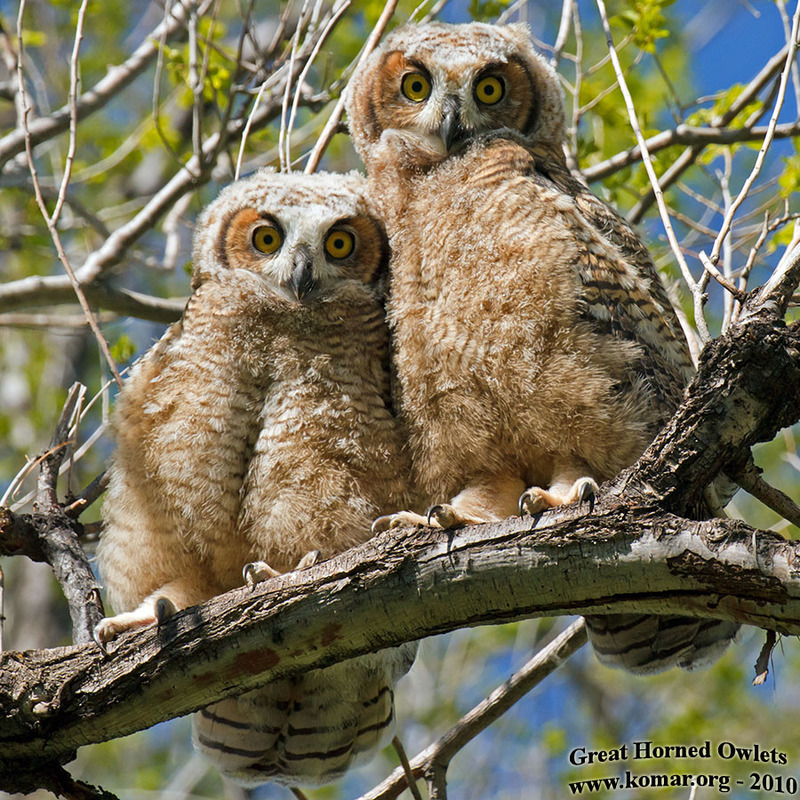 After circling around for good light - Brotherly love among Owlet Siblings! 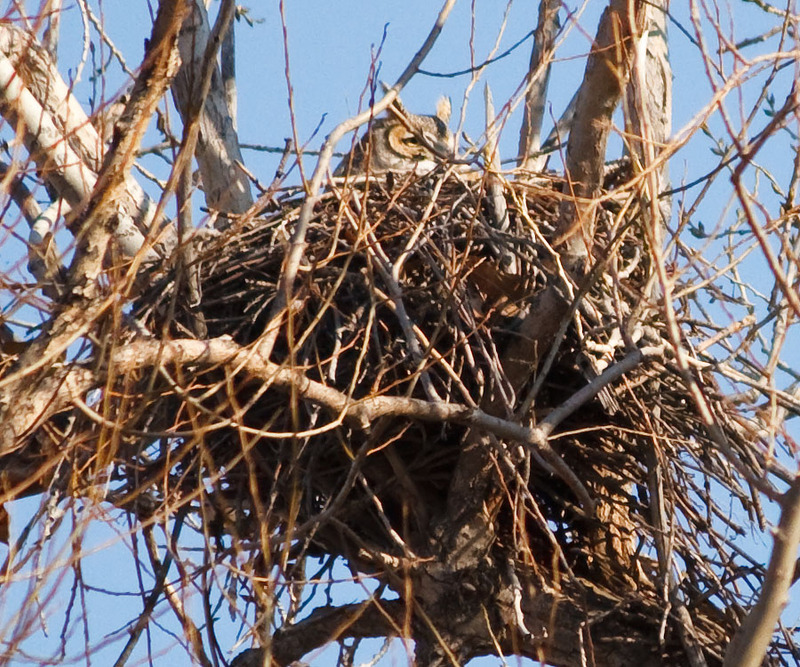 Probably the favorite picture of the over 300 I took that day! 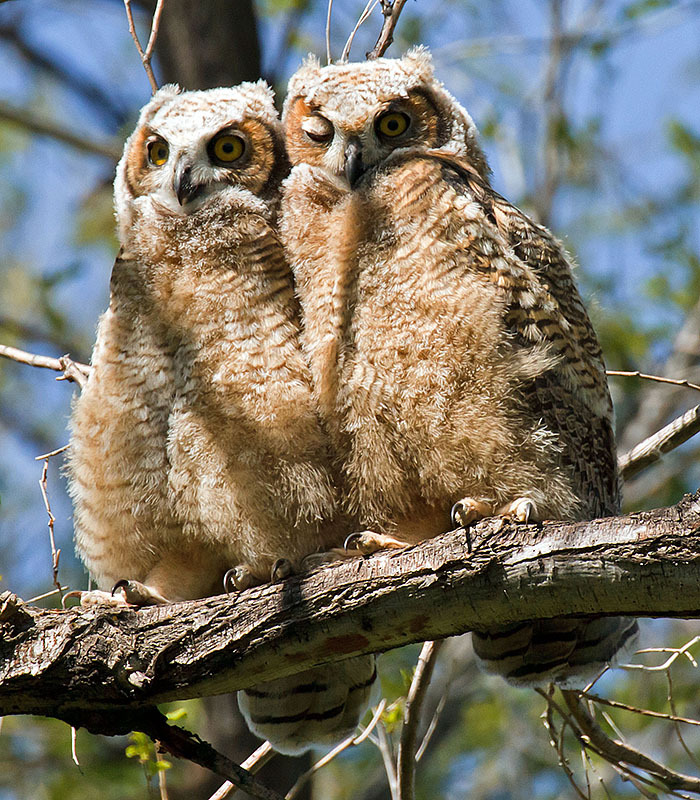 One smiles for the camera while the other says whatever! 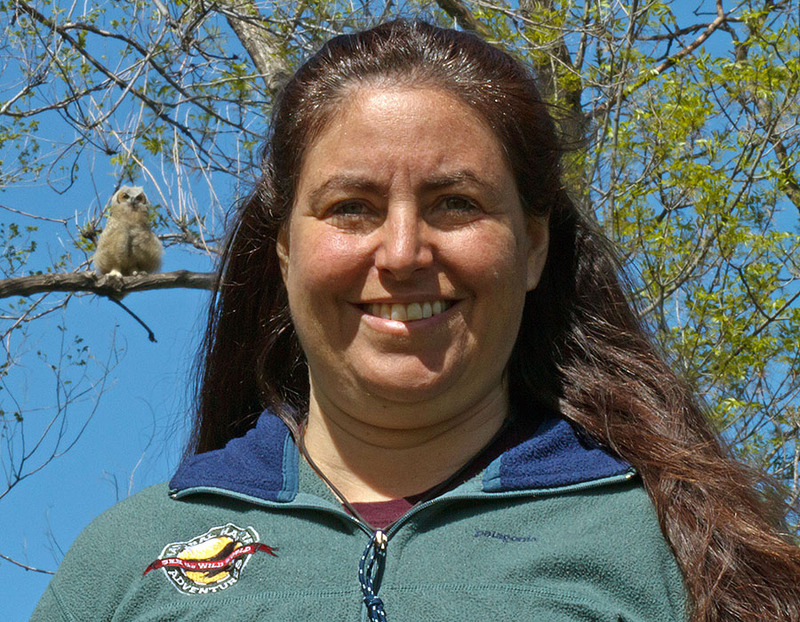 Owlet is almost perched on Wendy's shoulder! 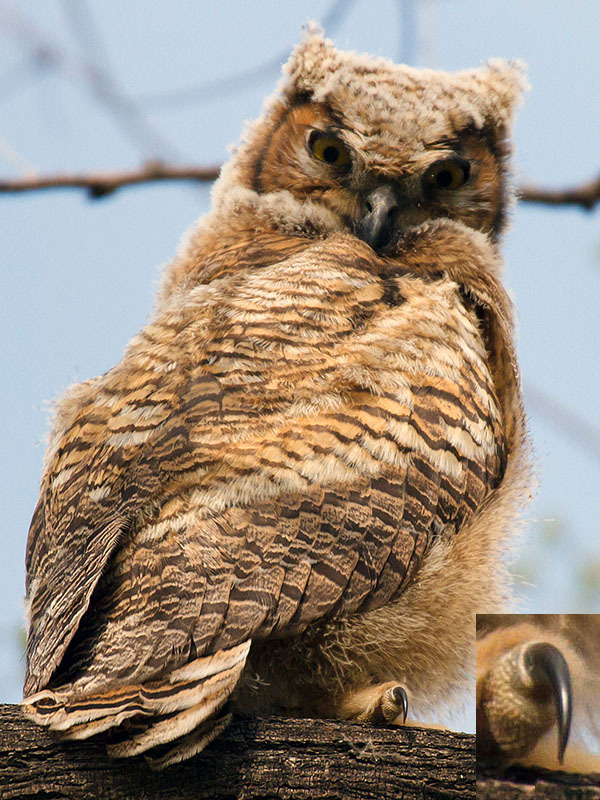 Photography Notes: These pictures were taken with a Canon 7D DSLR with a 400mm lens plus 1.4x and 2.x tele-extenders ... i.e. 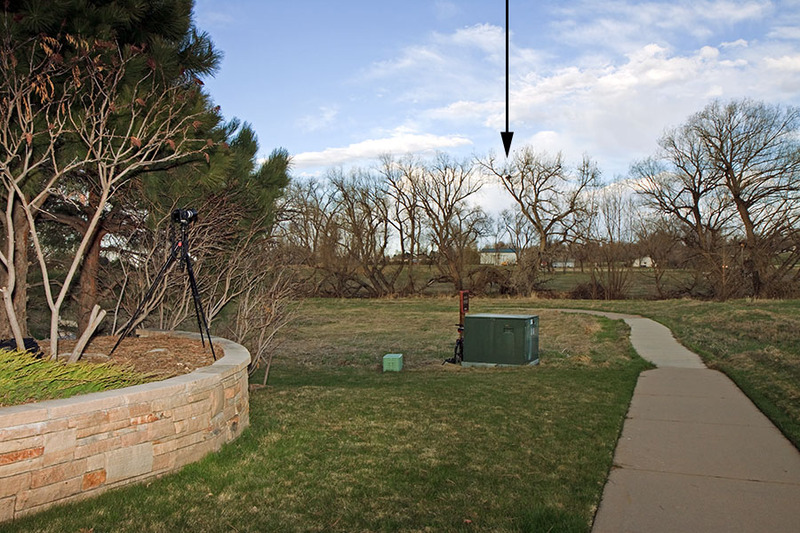 that's a 35mm equivelent of a 1280mm telephoto lens with 18 megapixels on target! 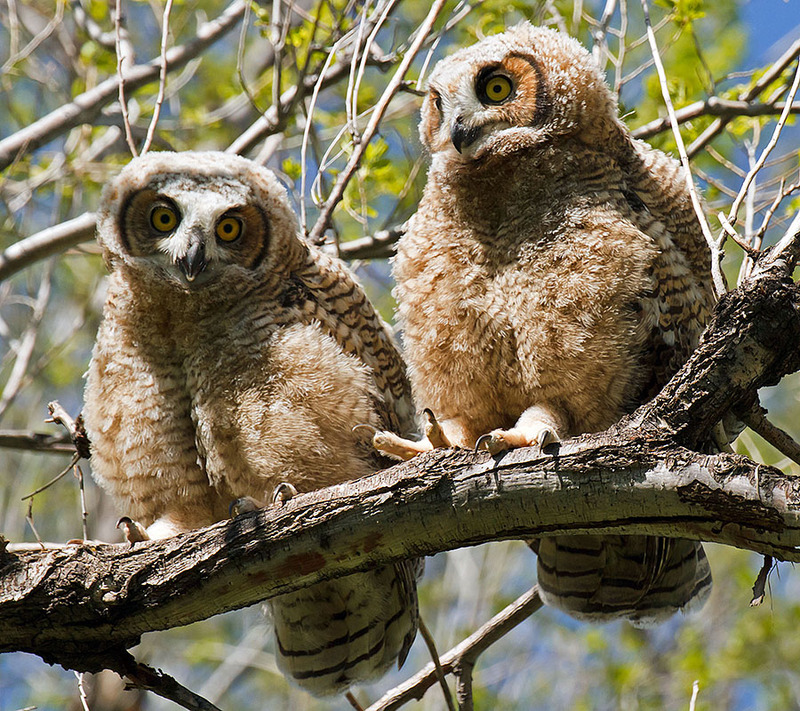 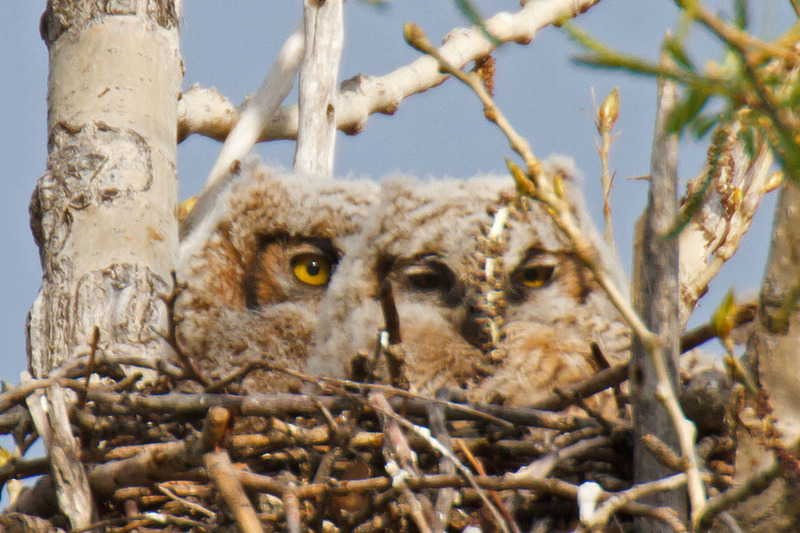 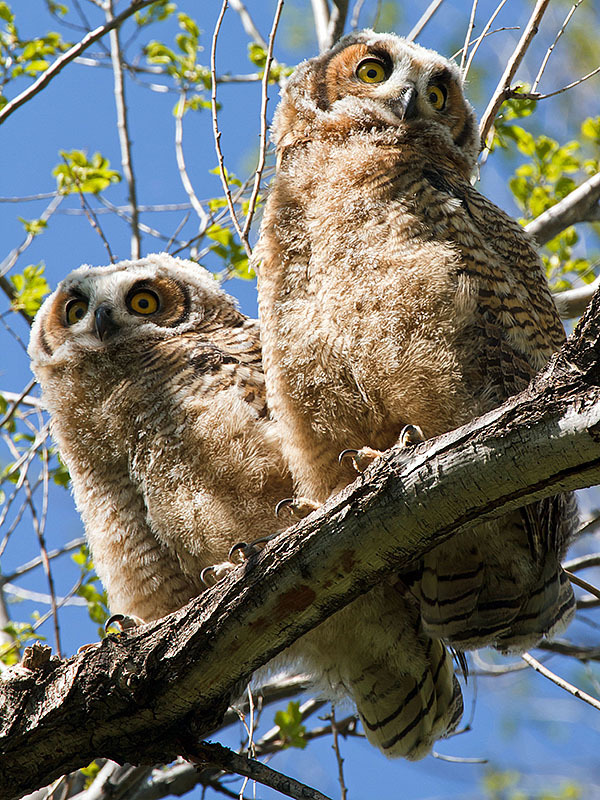 Unfortunately, I need all that since I'm about a football field distance away (literally) because of the vertical angle to see the owlets, especially when they were small. 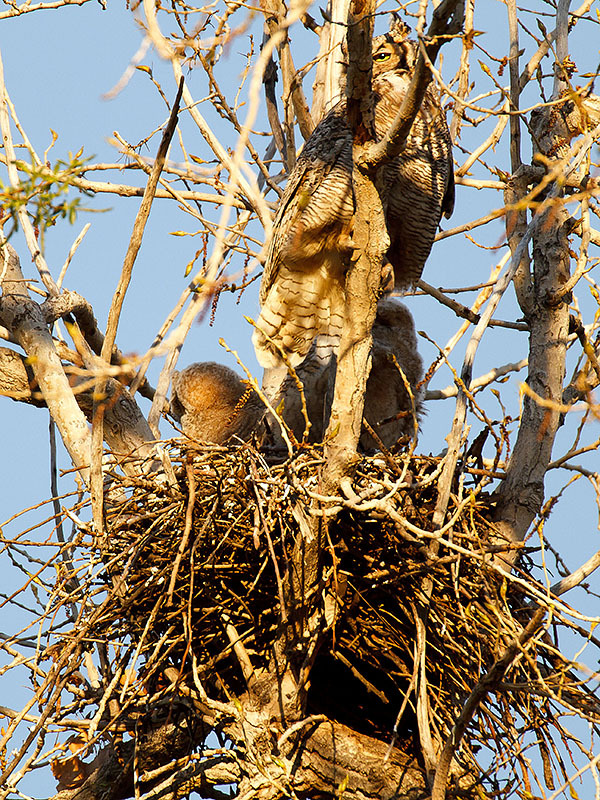 Manual focus is required which is challenging with all that reach (even though mounted on a tripod, the smallest touch or wind causes the image to jiggle), but fortunately, the nest doesn't move. 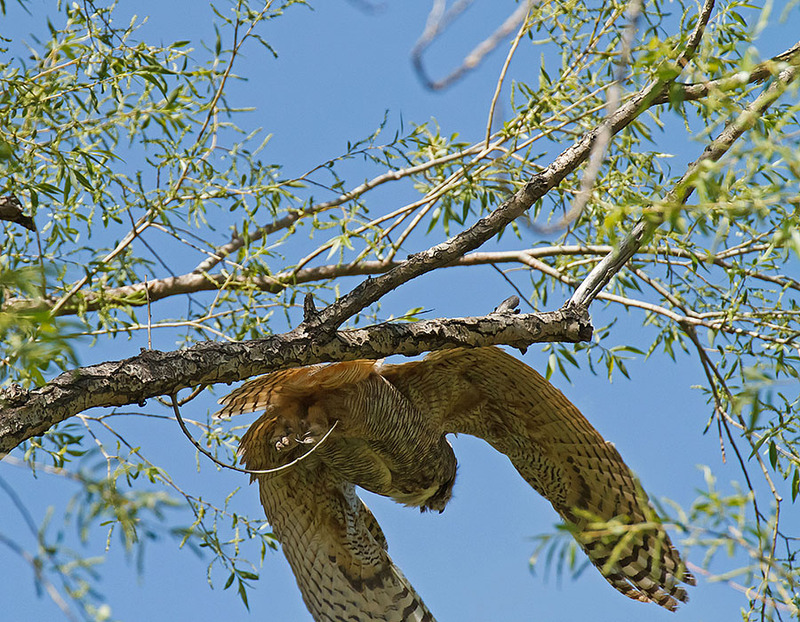 Too bad I can't get inches away like this house finch. 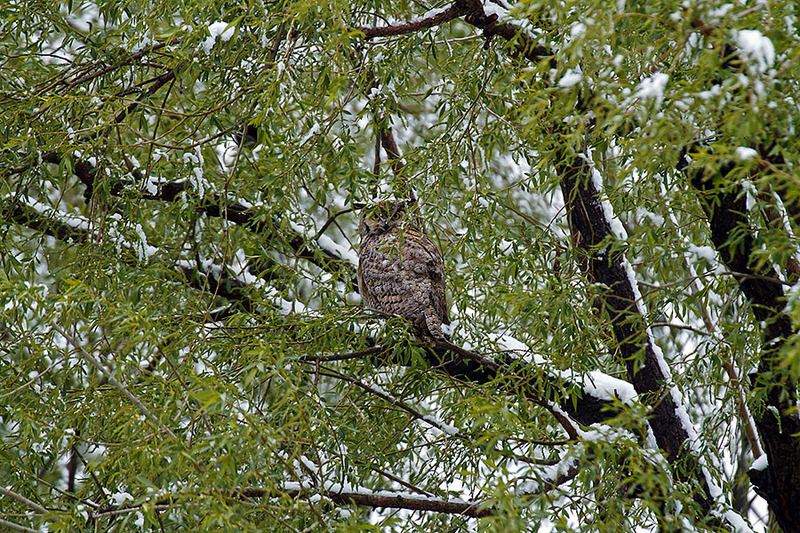 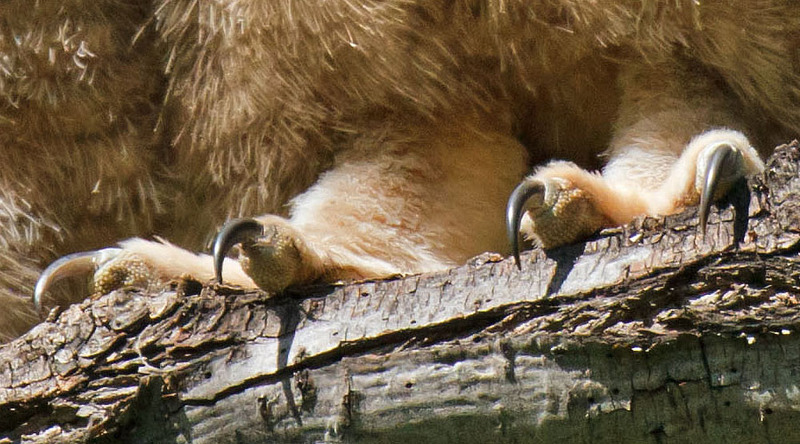 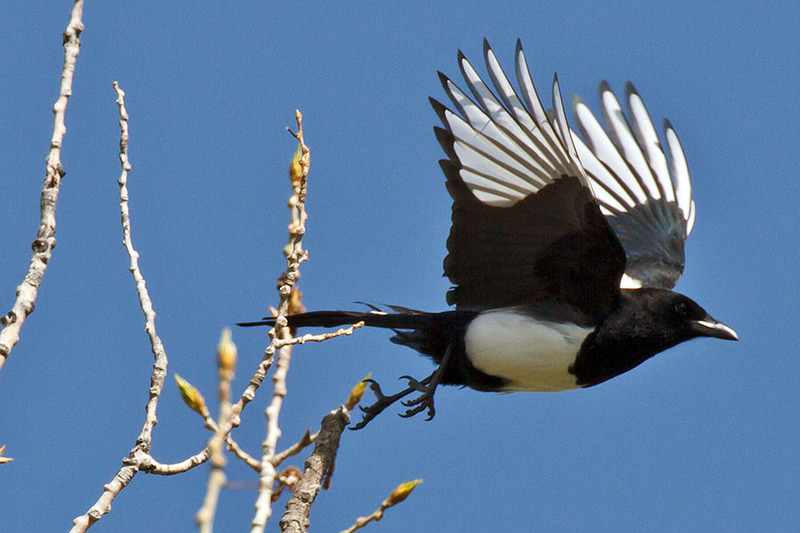 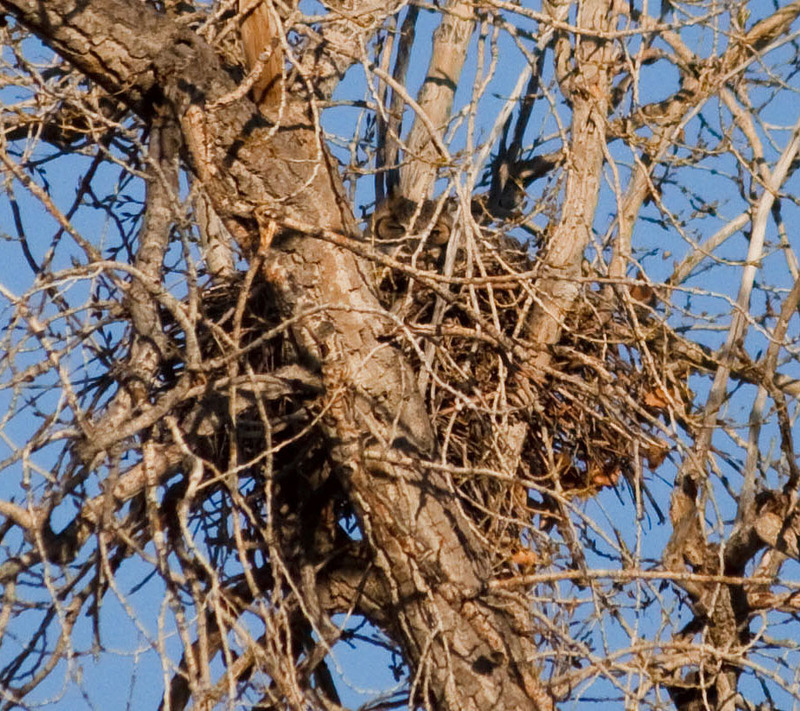 The 2005 pictures were taken with a Sony F828 digicam that maxed out at 200mm zoom, but shot from just below the tree. 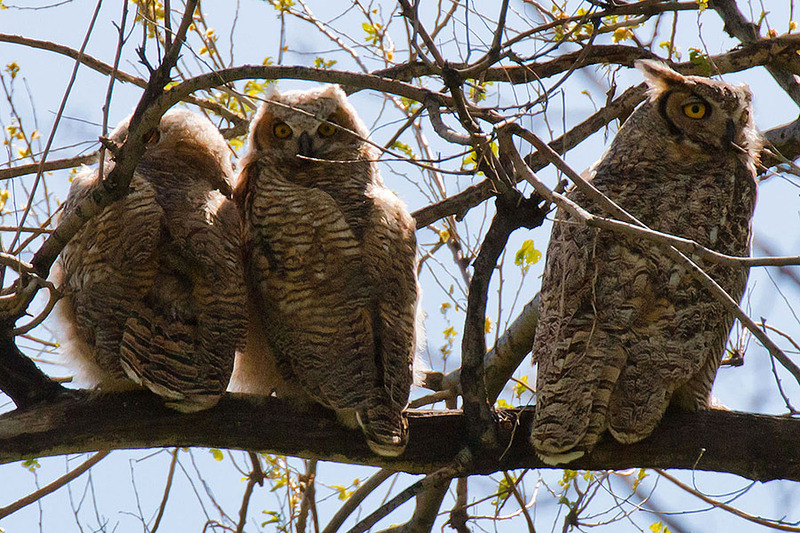 4/13: Video from neighbors deck - getting too green - darn! 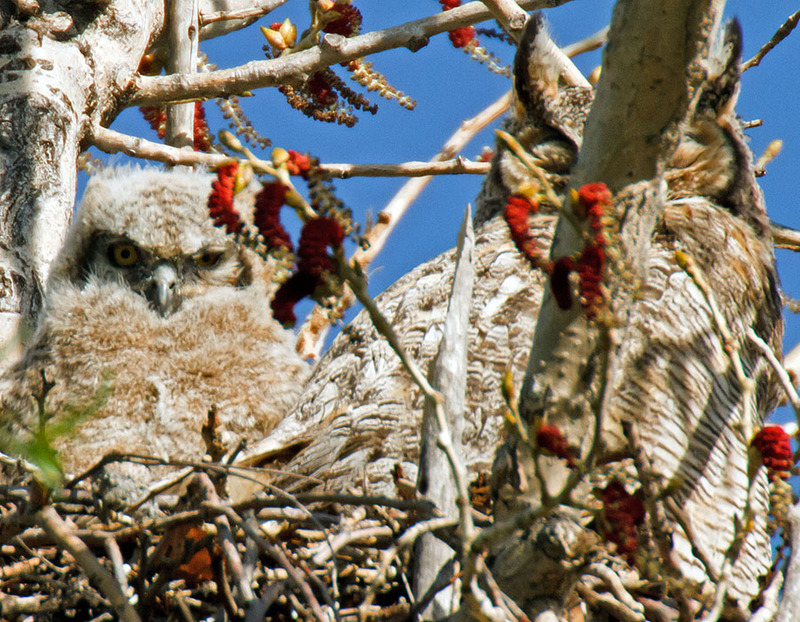 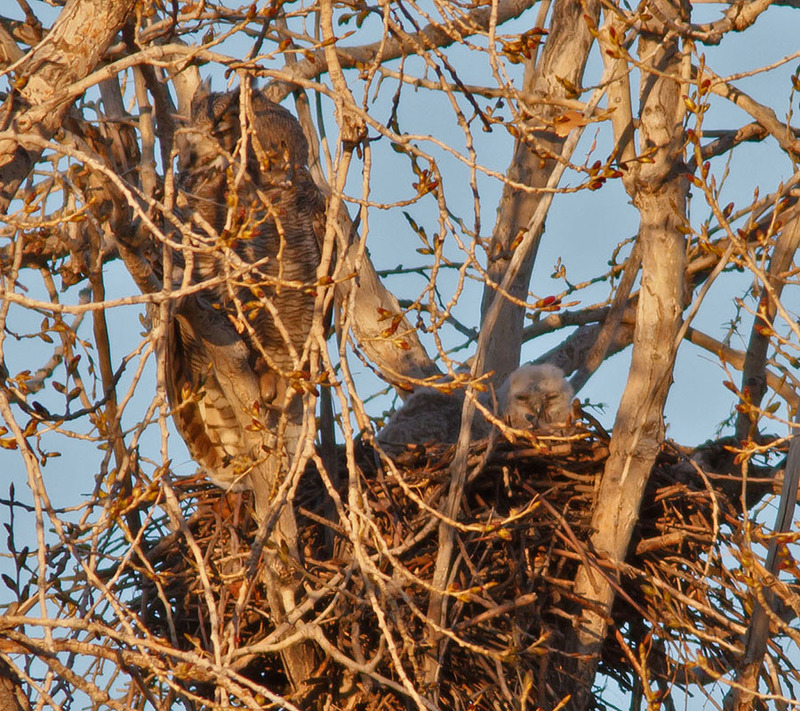 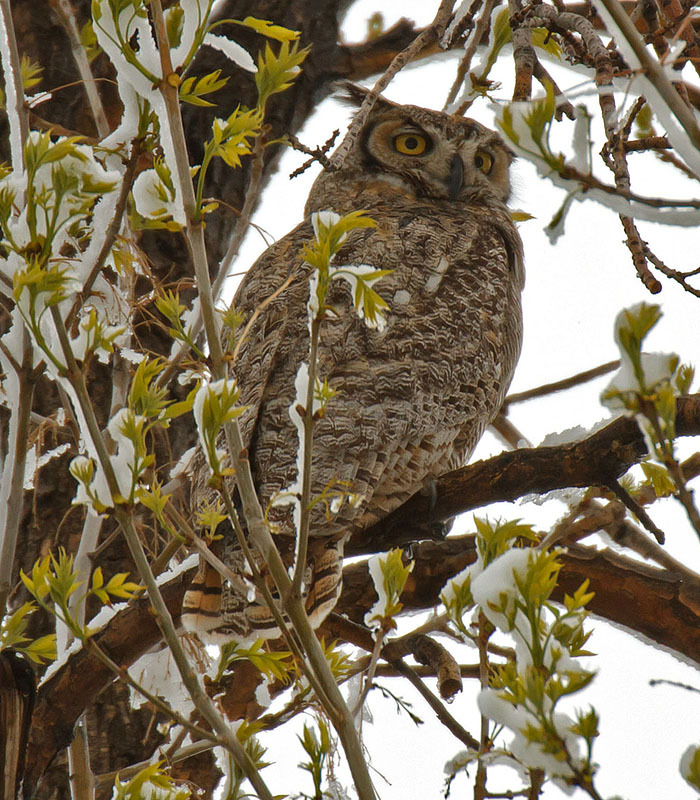 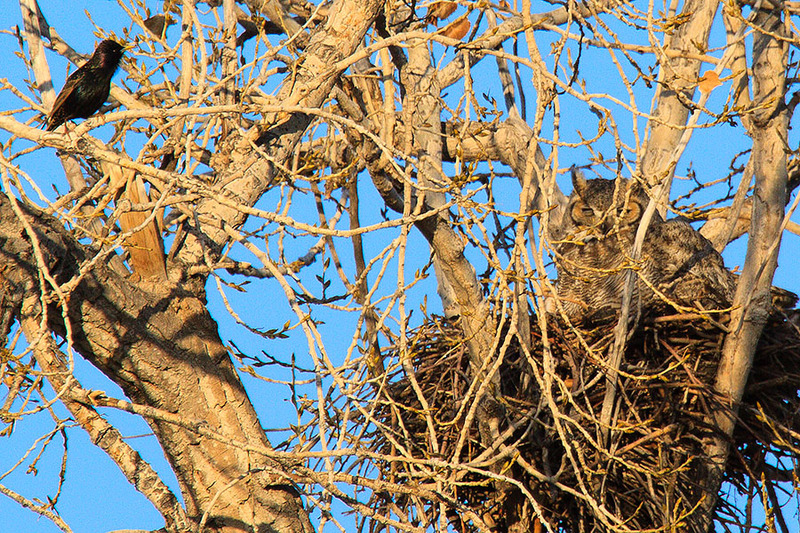 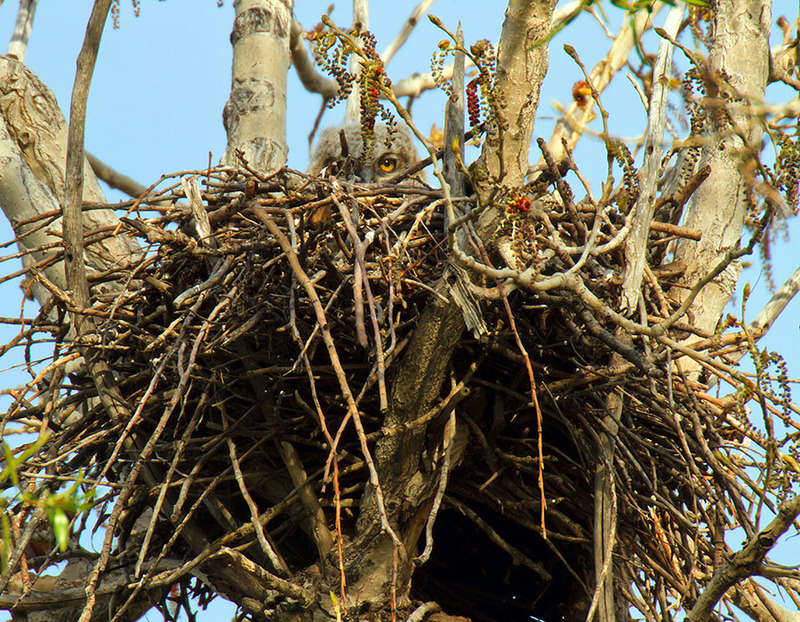 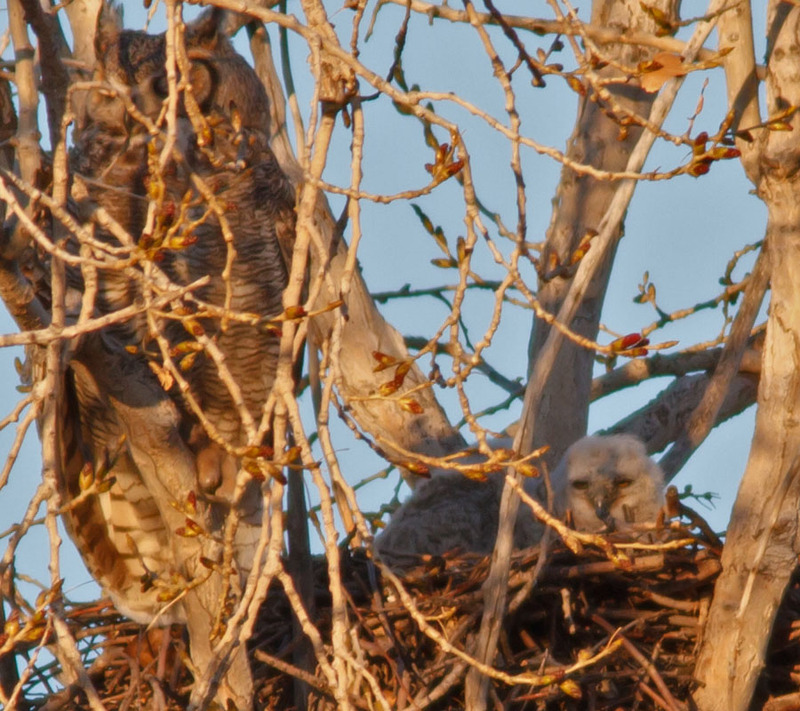 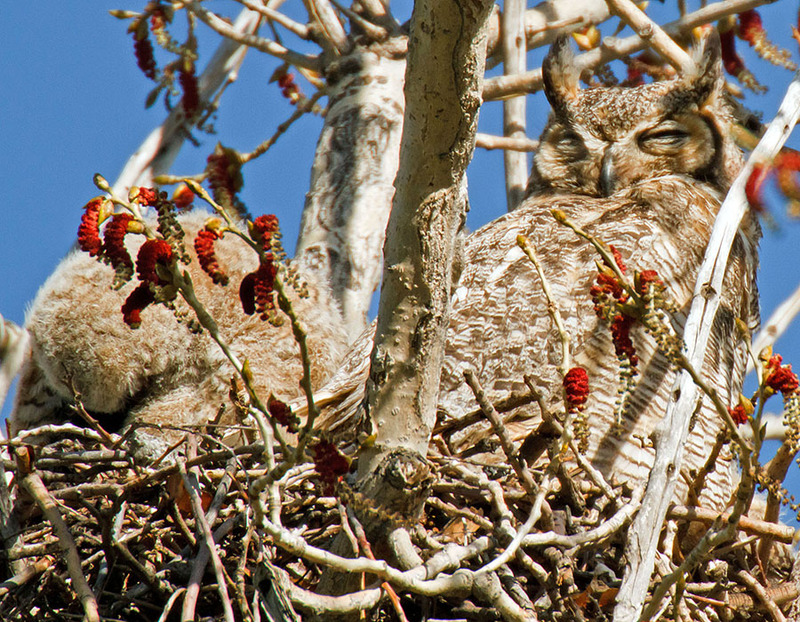 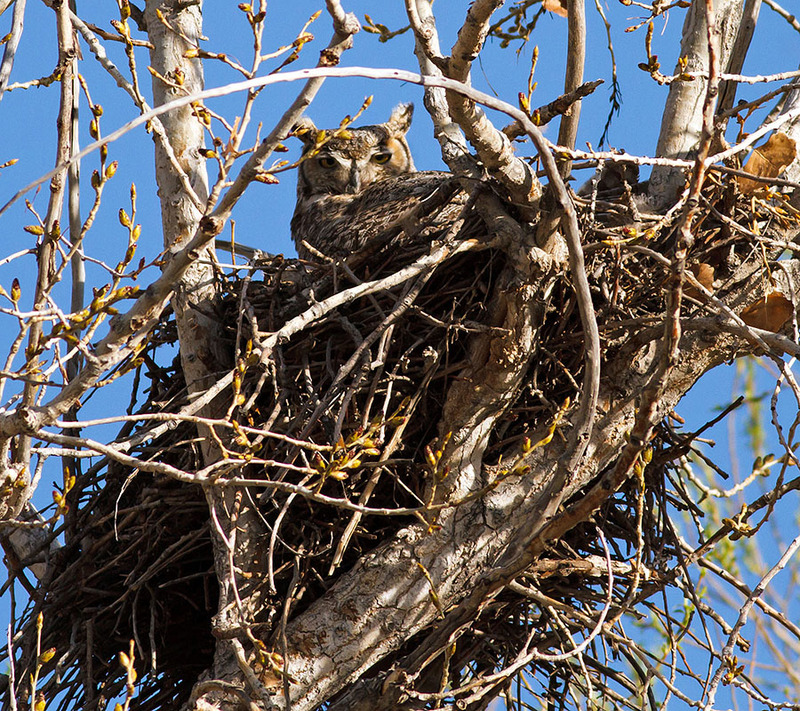 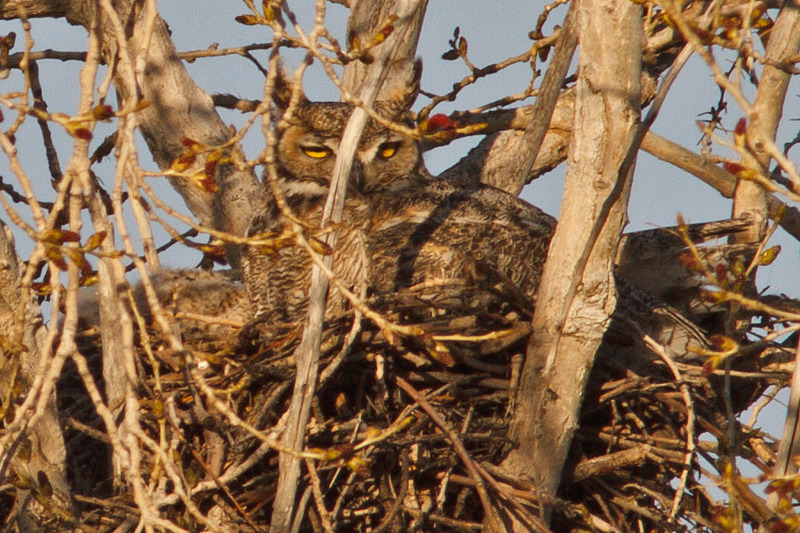 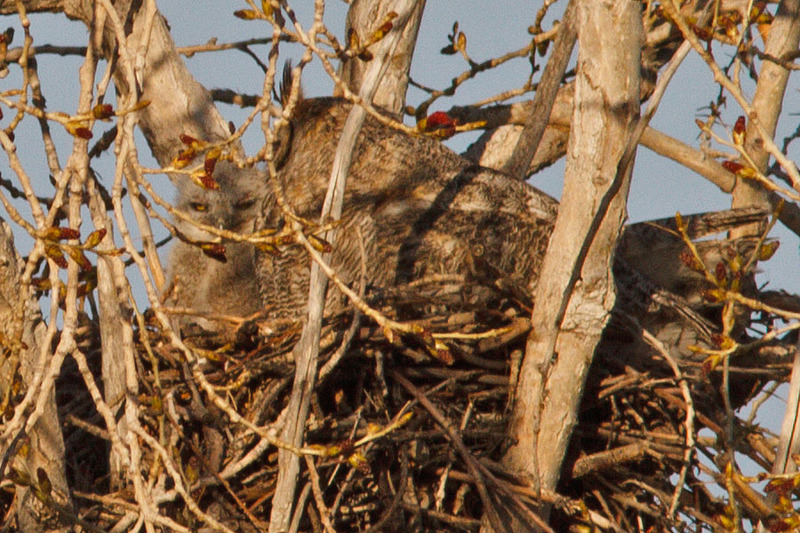 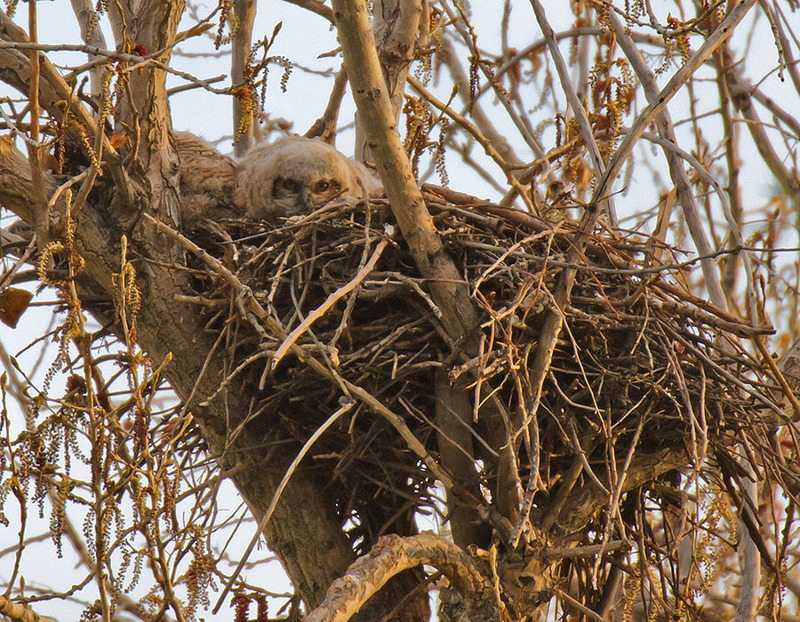 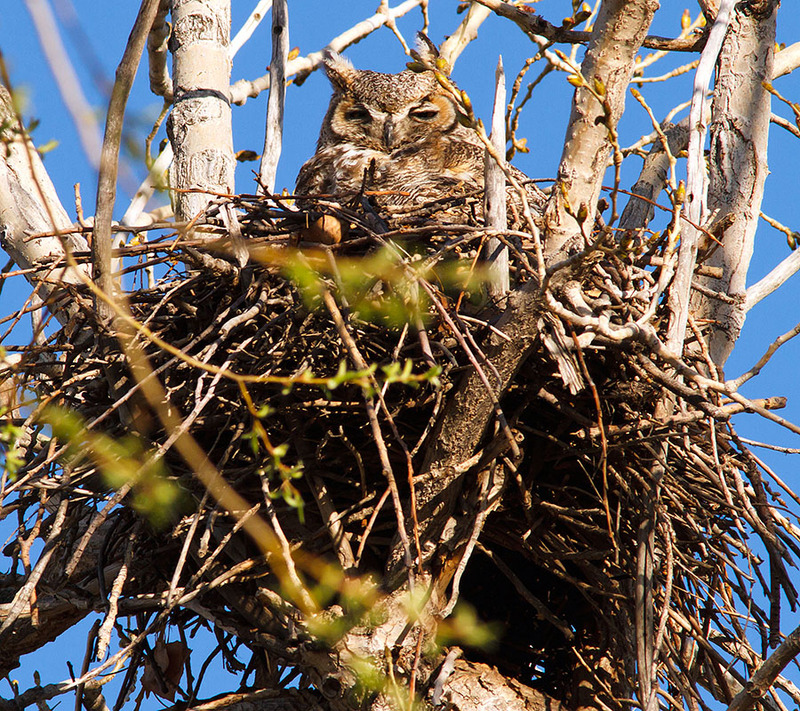 4/13: "Time for dinner" was prophetic - watch a squirrel check out the Great Horned Owl Nest - WILD! 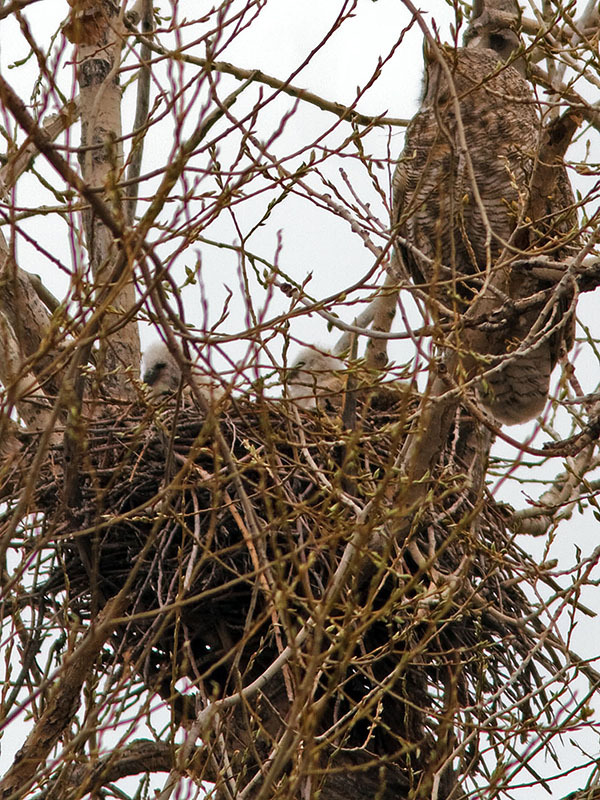 4/18: View from the neighbor's deck is getting cluttered - darn! 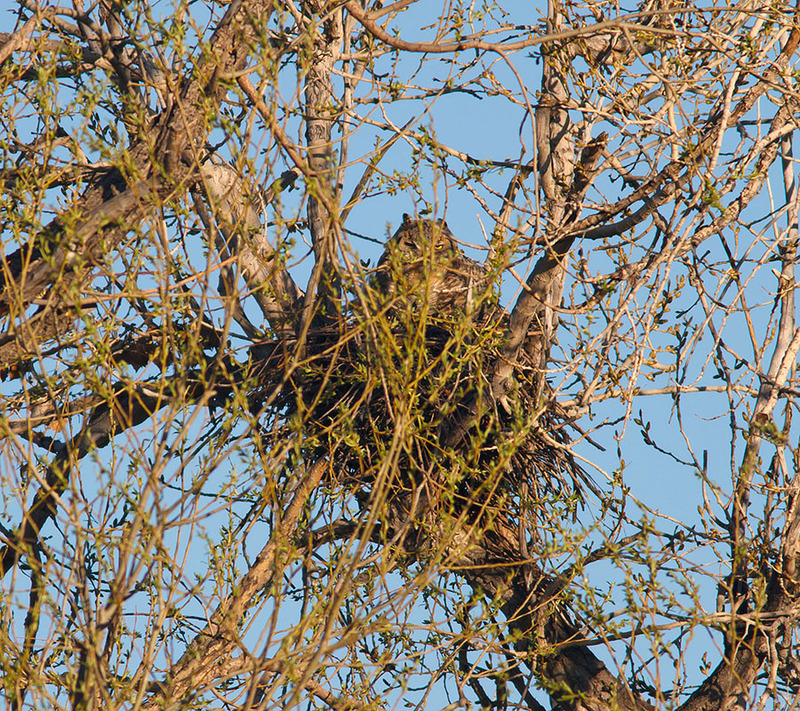 4/27: Momma Great Horned Owl in a nearby tree - out of the nest!